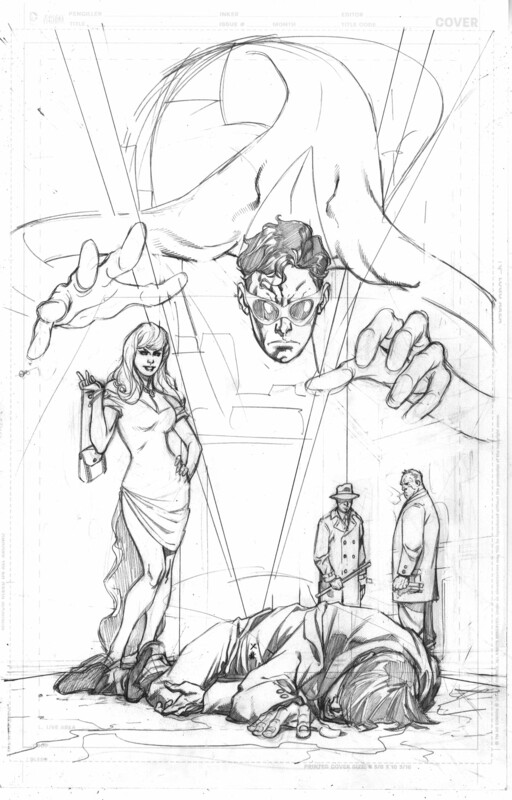 Plastic Man #1 Cover….How I did it! 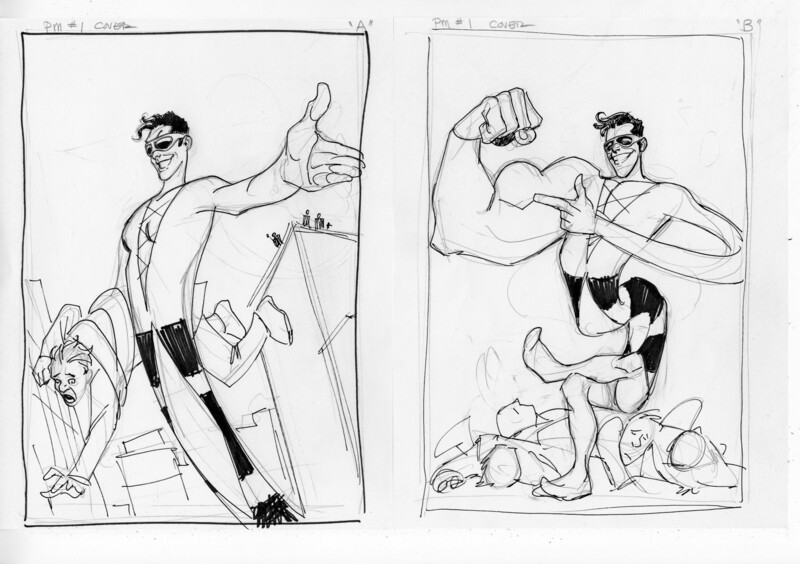 So lets take an in-depth look at how the Plastic Man Cover came to be from concepts to colors. I was thrilled to get this assignment but since it was/is to be an alternative cover, I was not entirely sure what overall vibe to go for . Old style fun or what appears to be the new direction, criminal noir. 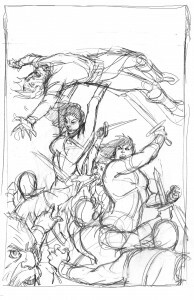 So I did four cover sketches each representing a different contextual angle. 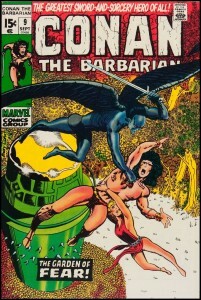 The first is an obvious homage to Amazing Fantasy #15 but it does represent a similar scene in the first issue. The second was based on a commission I did last year and absolutely loved. 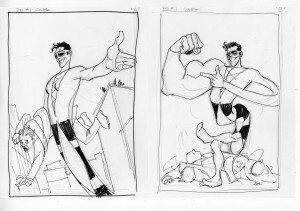 I thought the third one here is interesting in that it depicts the “new” Plastic Man bursting through a black and white photograph of the “old” Plastic Man and Woozie Winks. They chose the more noir-ish Eisner-esque option. Which I was perfectly happy to do since I am a big fan of that type of stuff, as well. 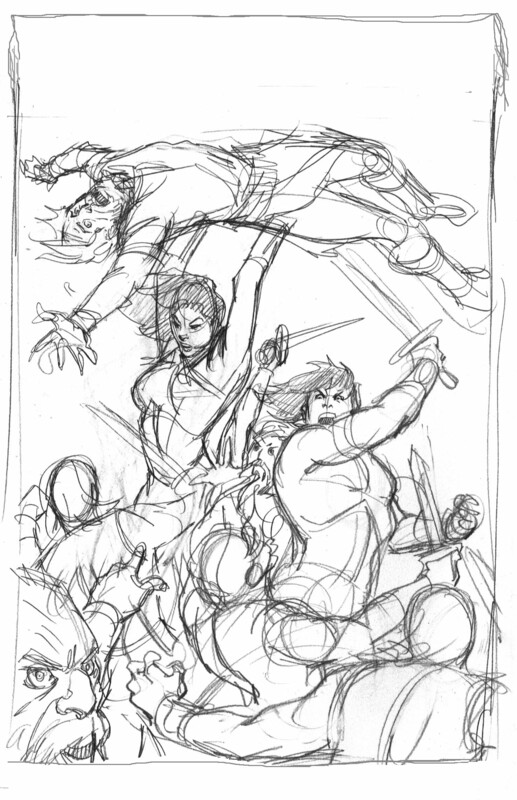 Penciling this proved a greater challenge than I originally thought. It’s really supposed to be Plastic Man over-viewing himself as Eel O’Brien after a beating he takes from his former partners that leads to his becoming Plastic Man. 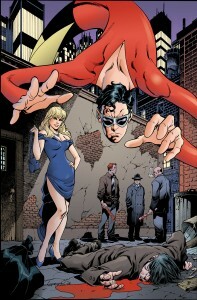 So Plastic Man had to be part of the scene without really being part of the scene. 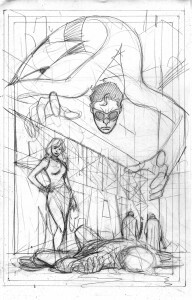 My original thought was to have Plastic Man stretching in from behind the background city scape but in order to have enough room at the top of the page, I would have had to shrink the foreground scene substantially which I thought would greatly lessen its impact. Dilemma. 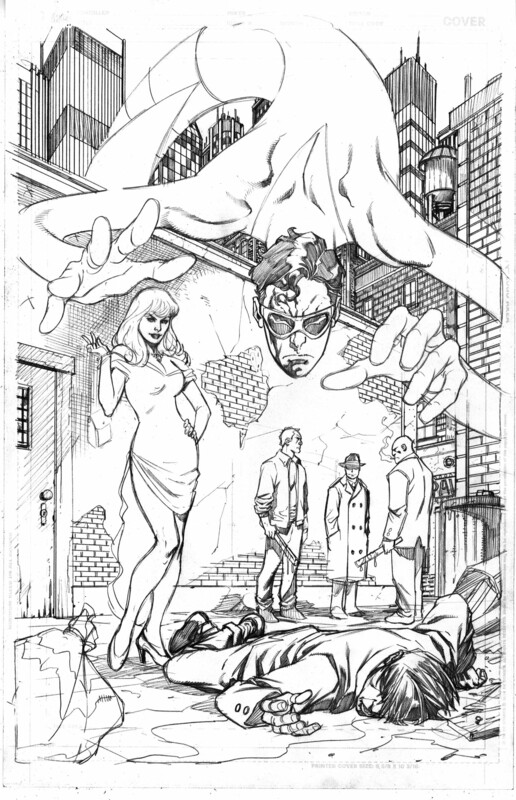 I thought of first making the foreground alleyway building actually be the name, “Plastic Man”. This would reinforce the “representational” concept of the cover and up the Eisner factor. 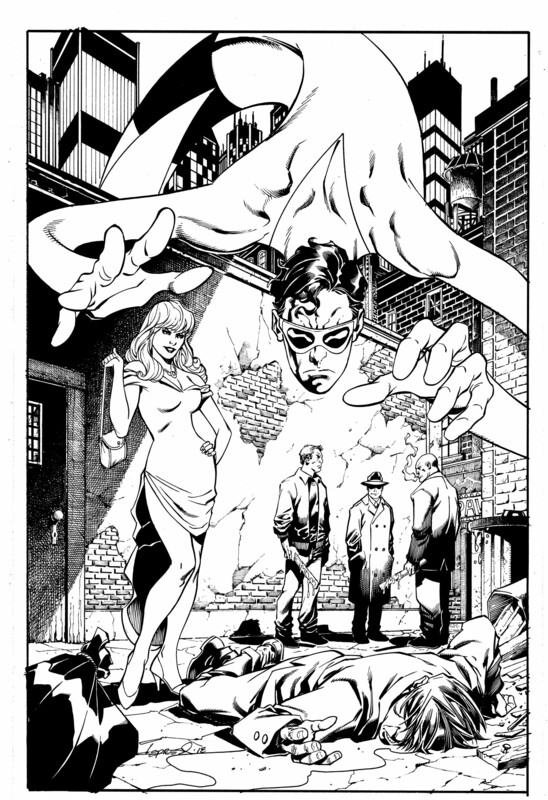 However, the femme fatale was too big and covered up too much of the name as to make it almost unreadable. 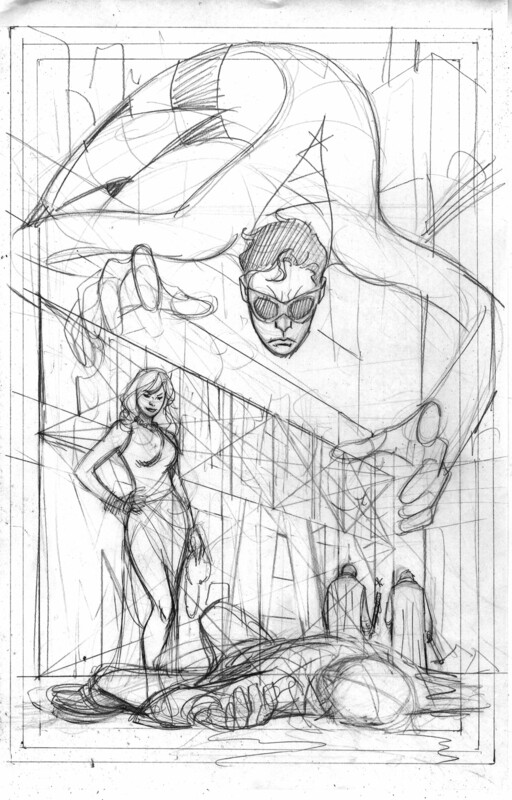 I wasn’t going to shrink the girl so I dropped the idea of using Plastic Man lettering on the cover. I also wasn’t convinced the layout perspective was the best choice. So I thought changing the perspective to clearly show both sides of the alleyway might be better. 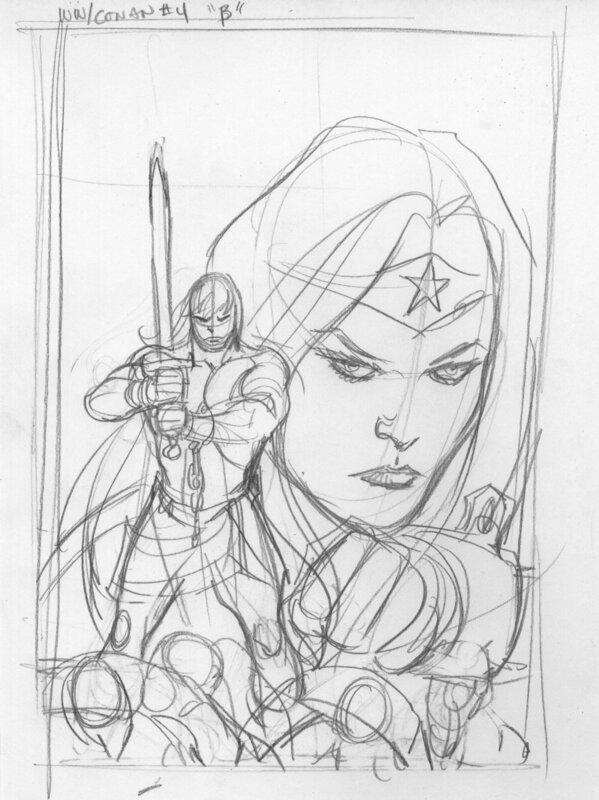 The vanishing point would be right in the center of the cover drawing the eye right where it should be. 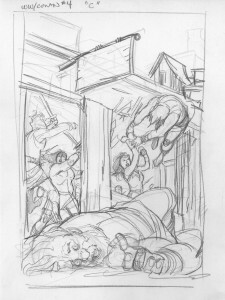 This would also make it easier to have Plas coming from behind the background cityscape. 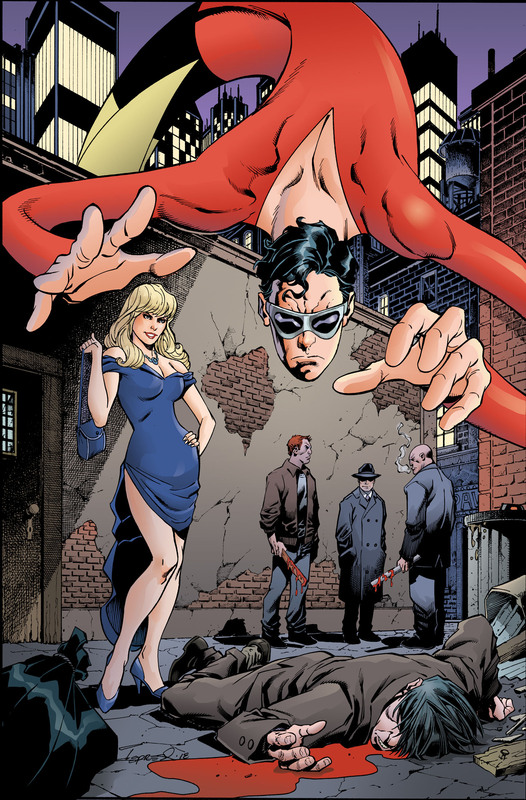 I finally came to the compromise of lowering the alley wall and having Plastic Man coming over the top of that building rather than from behind the background cityscape. In doing this I was able to keep the size and angle of the foreground scene intact. I did have to raise the horizon line just a bit but I was still able to keep most of the drama from the original low angle shot concept. I liked how it turned out so I inked it. Mostly brush on the figures and pen on the backgrounds. The coloring on this was pretty straight forward. I used the violet/blue background sky color as my base. I added a variation of that violet to drop over the thugs in the background to help them recede and to maintain the feel of a night time scene. 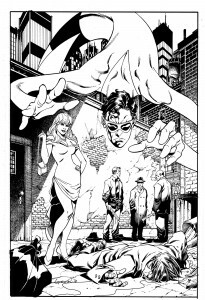 The bleeding body of Eel O’Brien and the Femme Fatale are better lit because they are the focus of the scene, along with Plastic Man coming in over the top. I used some of the background violet on Plastic Man as a”kicker” light as well as a white highlight coming from the right side to give him a more dimensional feel. I also made sure his red costume was not too red as to be distracting. It looks red but it is not nearly as pure red as it was when I initially dropped the color in. I ended up laying a 15% violet/blue over all the inanimate objects to help maintain color harmony. Even the browns and grays in the alley have a violet/blue tint. 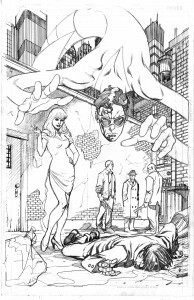 There is a an artificial highlight on the wall behind Plastic Man to help draw the eye to where it is supposed to be looking. I’m quite happy with how this turned out and I think it is one of my more successful covers in recent memory. 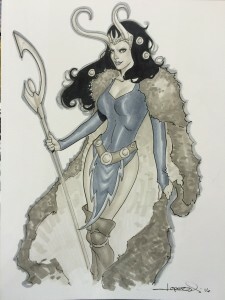 If you are interested in having me do a commission before a convention you will be attending for pick up at that show or if you would just like to get on the list for a commission done at the show, here’s how it works. 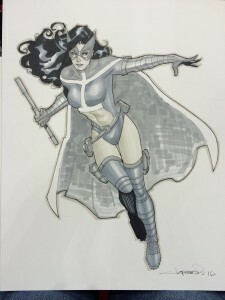 Show commissions are 11X14 single character gray tone marker drawings. They are $200. 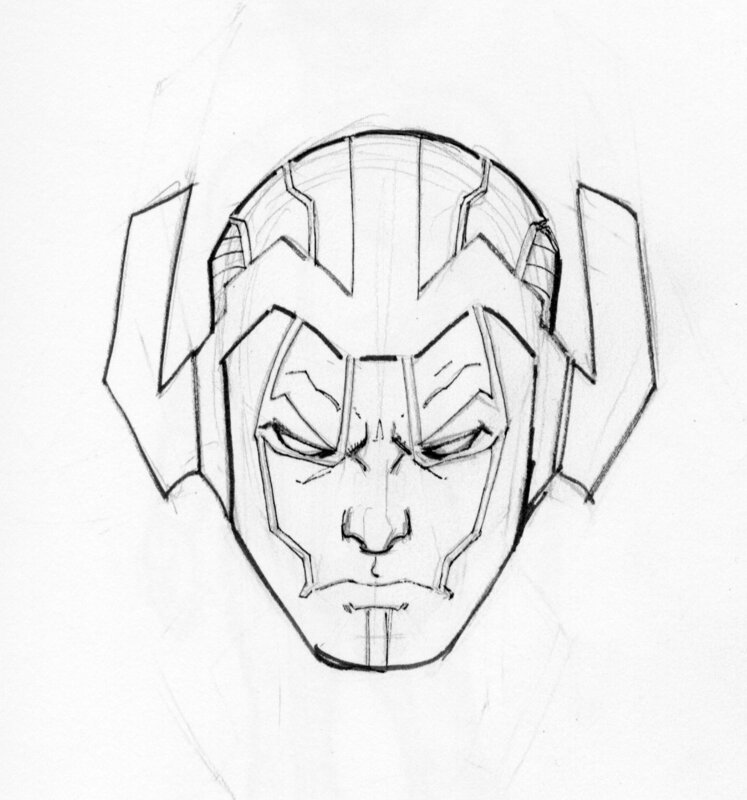 I also will do nice 11X14 head/bust shots for $100. I do sketch covers for $150. Again these are single character pieces. You can sign up at the show but there is no guarantee I will get to it depending on when you sign up. If you contact me prior to the show I will put you on the list to secure your spot but you still have to check in with me at the show before I will start it. 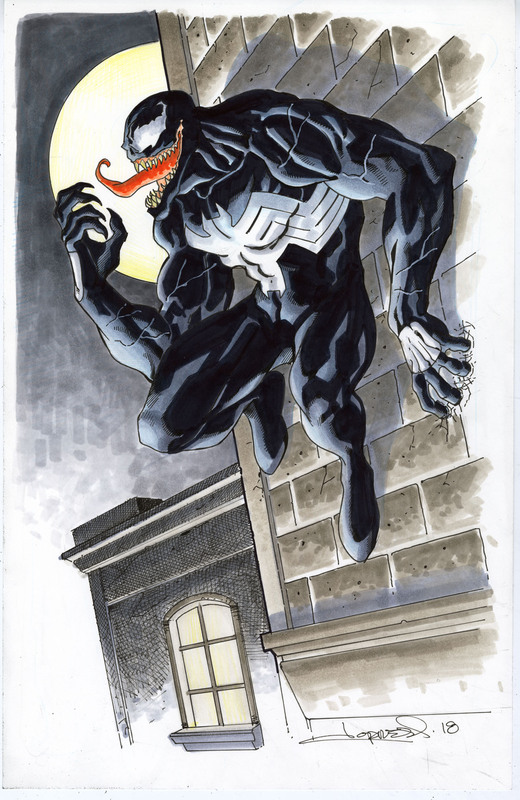 There is also the option of getting a pre-show commission to be picked up at the show. I only do these as 11X17 single character with limited background and in color. 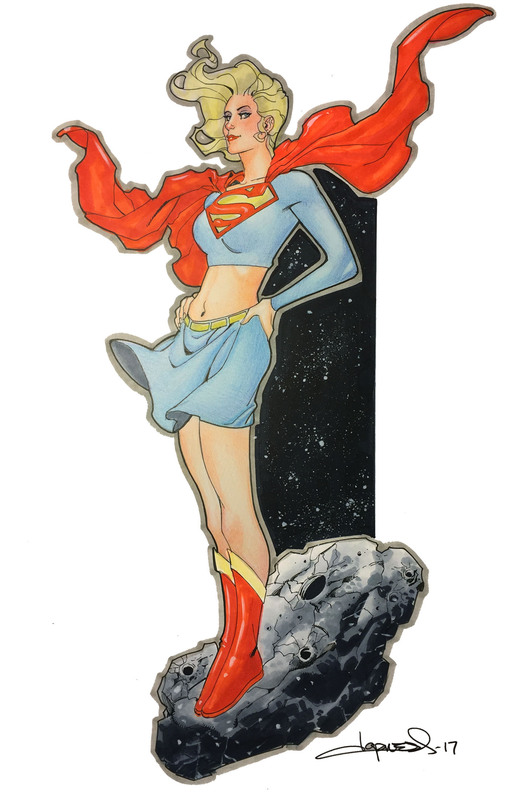 These are colored with a combination of markers and colored pencils. I usually need a week’s notice but sometimes 3 days is sufficient. (Depending on my workload) These are $350. 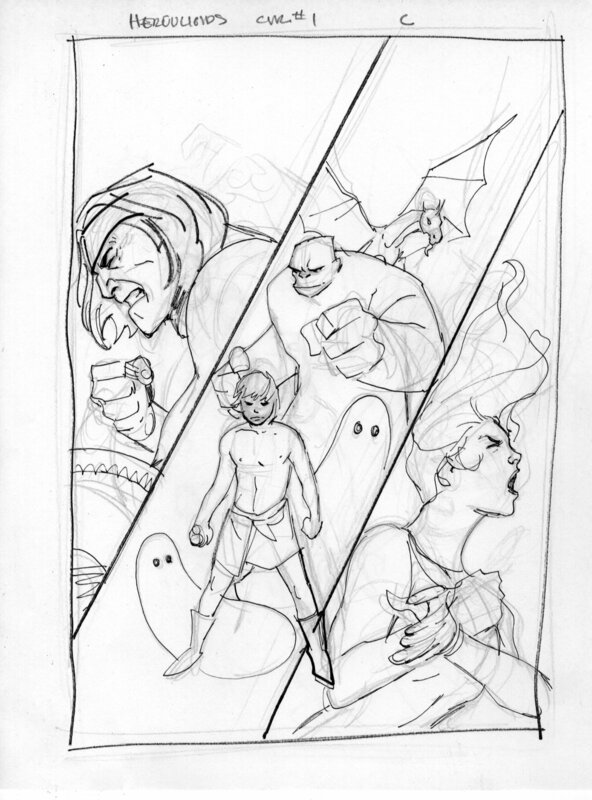 I just finished a Herculoid’s page and I need to jump on a cover but I am going to take the time to blog first. 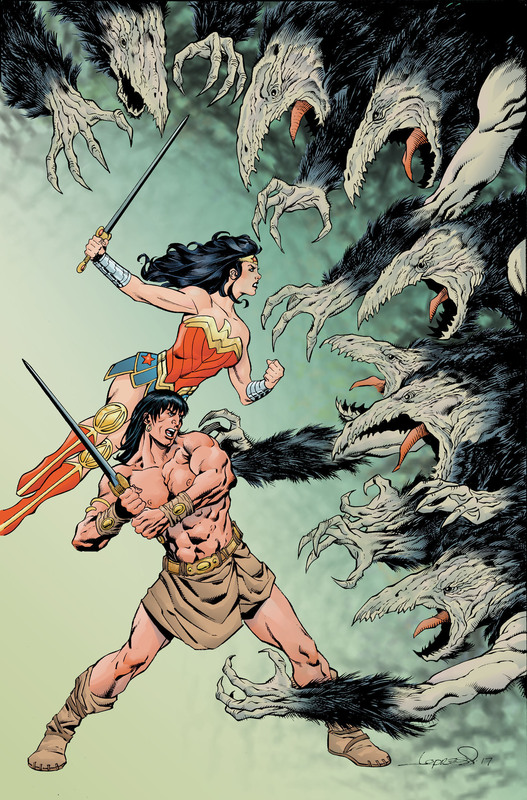 Let’s take a look at my final variant cover to one of my favorite projects in a long time, the Wonder Woman/Conan mini-series. This was my final shot at drawing these two together so I wanted to really have a nice illustration to grace the cover. 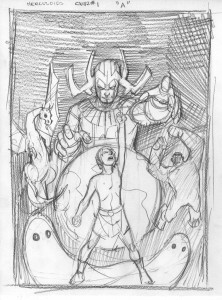 So I came up with several sketches that in some way represented the content of the issue. If not literally, at least figuratively. 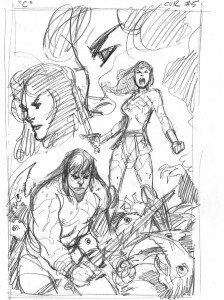 “B” is my least favorite of the four but even if that one had been chosen, I would have put Wonder Woman and Conan into more dynamic poses and it would have worked much better. 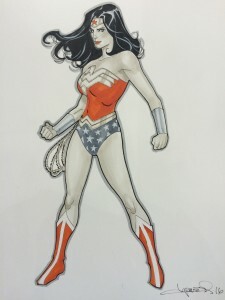 I kind of liked “C” because of the big shot of Wonder Woman but “D” is the best design and sure enough, it was picked. 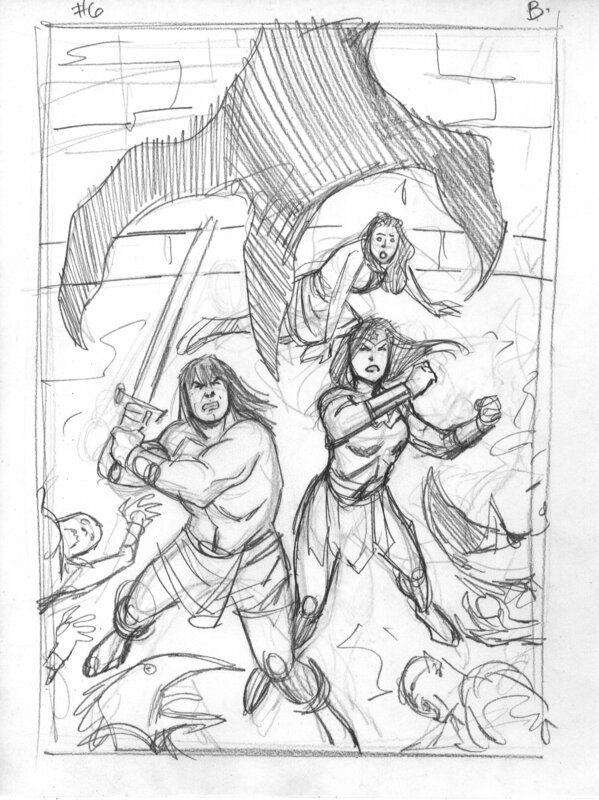 Interestingly, after I drew this cover rough, a Barry Smith Conan cover came to my mind. I wondered if I had sub-consciously lifted the design. 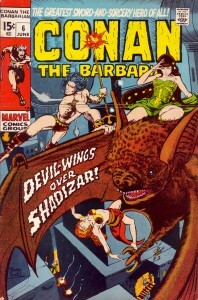 I immediately went and checked my Conan collection and found that it was a strange combination of two Smith covers. Not exactly the same but certainly in the same ball park. 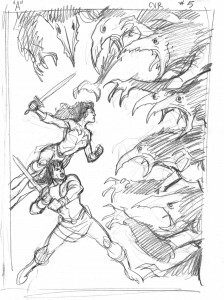 Feeling I was safe from swiping, I went and penciled the cover adding a rather detailed background that wasn’t evident in the sketch. 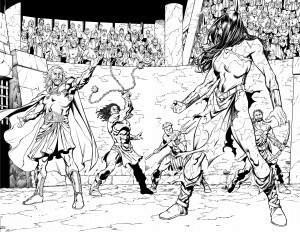 I originally thought of putting them over the gladiatorial arena from the series but an empty coliseum seemed less appealing than the city. So I went with the city. 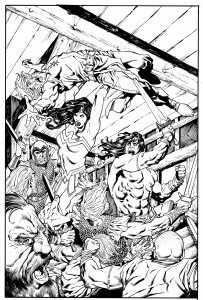 Unfortunately, like a dummy (again), I forgot to scan the pencil drawing (again), so I can only show you the inked version. I would like to point out the circular design of the main characters. It is something that I seem to use quite a bit either consciously or sub-consciously because it works. 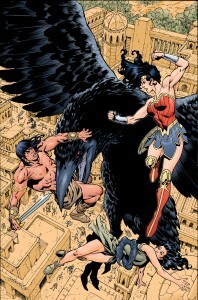 The characters are all facing each other and the central figure of the bird. It keeps your focus right where it should be, on the action! The girl being carried by the bird, it could be argued, should have her right arm pointing up rather than extending to the corner of the cover. I probably could counter by saying “the girl’s face and eyes are leading the viewer back up and that’s what you are looking at anyway”. But bending her arm up at the elbow probably would have still been a better choice. 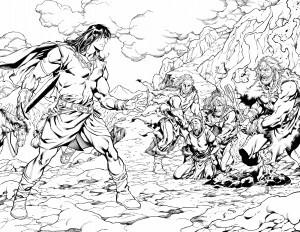 I also could have dropped Conan’s sword so it was pointing at the girl but it would have been too passive of gesture from him. Besides I think the bird’s beak carries you down to the girl anyway. Enough of Art Theory 101. 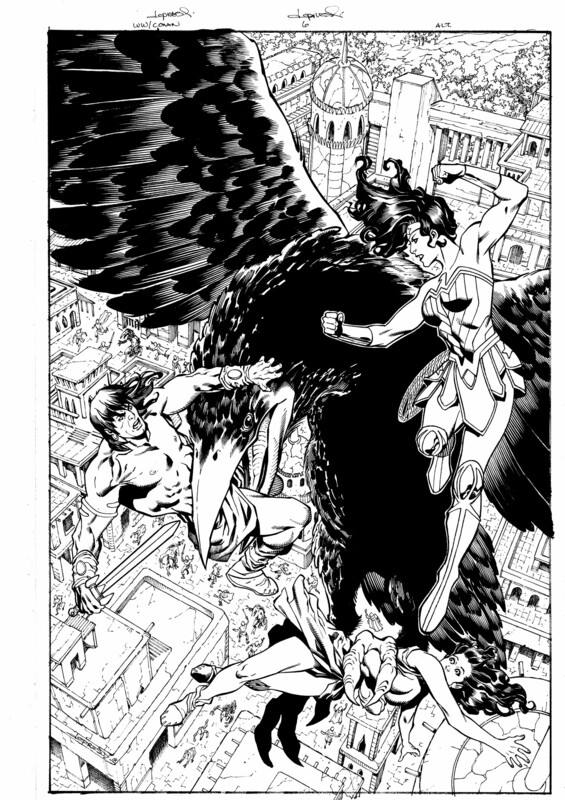 I inked the bird and the characters with a brush and the city below with pens. I threw in some tiny town folk and tiny monsters in there to make it look inhabited but not so much that it drove me crazy. Drawing the buildings and structures drove me crazy enough. Rulers have never been my friend. As usual, I wasn’t sure what I was going to do with background. I colored the bird and the figures first (which is exactly backwards to what you would do if you were traditionally painting) but since I knew I could change the background color at will, I took advantage of technology. I looked at some stills from the movie Prince of Persia and decided the city would really be mostly sandstone or sandstone looking so I went with sort of a yellow ochre….sort of. I originally thought of using a mauve for the shadow areas on the buildings (yellow purple complimentary) but I found it too distracting. 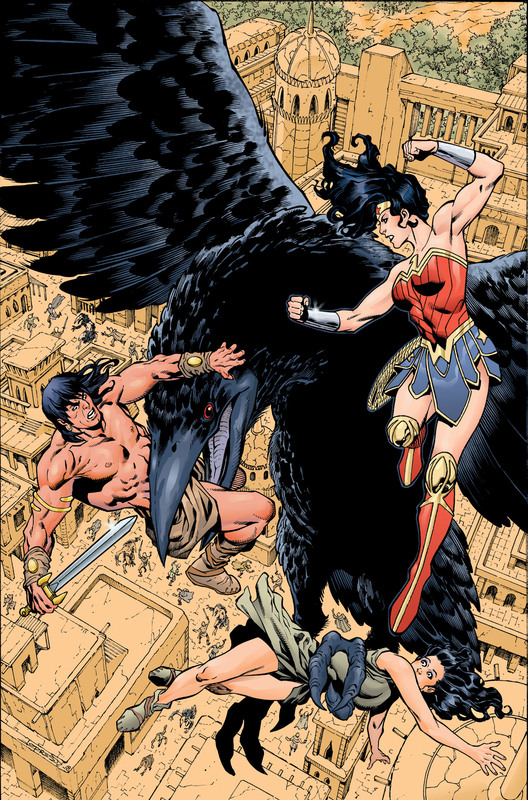 The focus should be on the characters fighting the giant bird, not the background. So I went with a slightly darker sand color. It gave me some depth without drawing attention to itself. I also had to be careful with the trees at the top. I used a very bland olive green (yellow/orange leaning) so they would separate themselves from the city without calling much attention to themselves. Overall, you’ll notice that once again I have used essentially and orange blue complimentary. The bird is blue with the other elements (people, background) containing red/orange leanings. You see a little bit of the background color incorporated into the flesh tones of the characters as well. All in the name of color harmony. They need to be connected without blending in together. Anyway, all in all, probably my favorite cover of them all. Thanks for stopping by! I’m not one to do rapid fire blogging but I seem to have a bit of flexibility in my schedule right now, which is affording me a few extra minutes to do this. 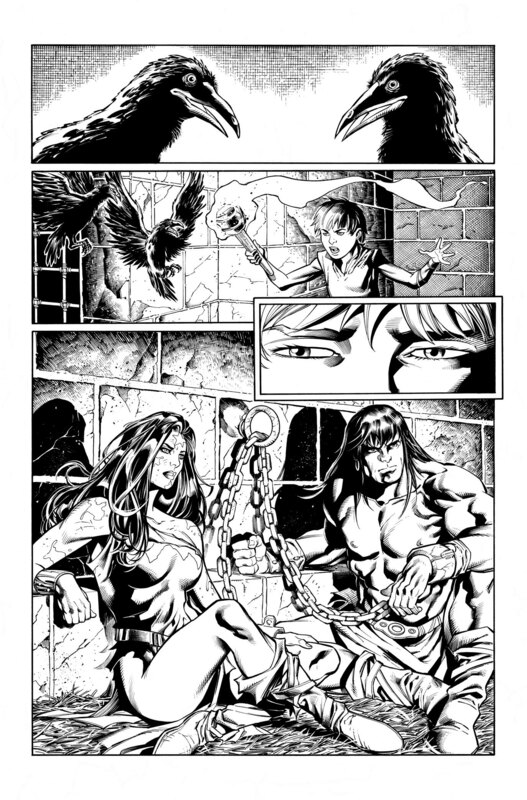 I also just received pages back from my inker, Matt Ryan, and I was blown away by his work over my pencils. So I am super motivated to post them. 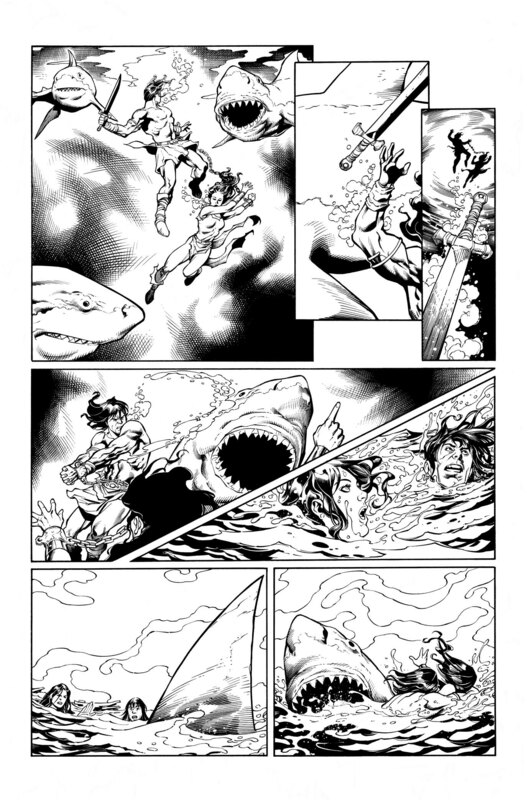 Let’s take a look at a few really nice pages from my current project, Wonder Woman/Conan. 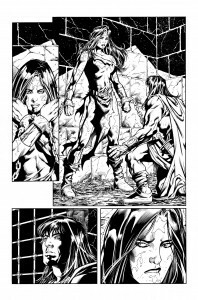 Back in September I did post some of my favorite pages from issue #1, so it makes sense to me to start this blog with pages from issue #2! 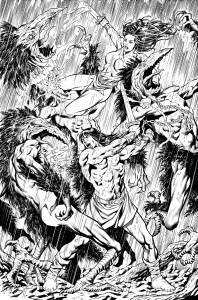 This is page 5 and is the first shot of shirtless Conan. It also offers a more casual moment with our heroes. 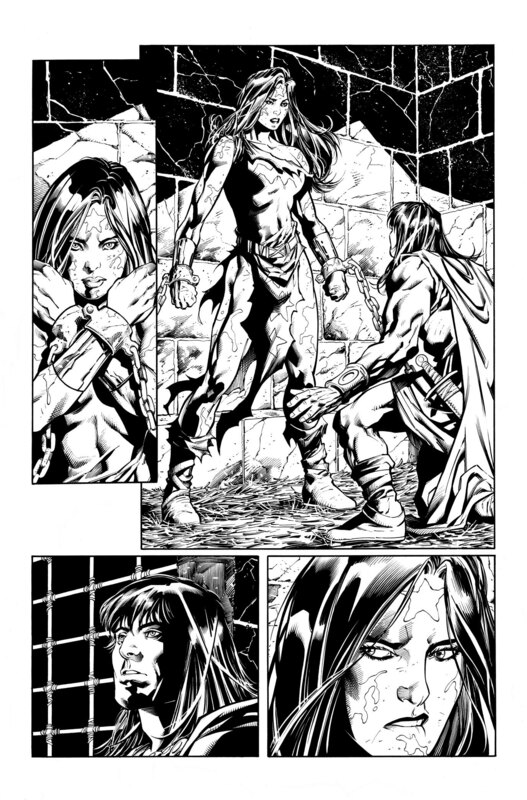 There is a lot of very nicely done cross-hatching on this page. 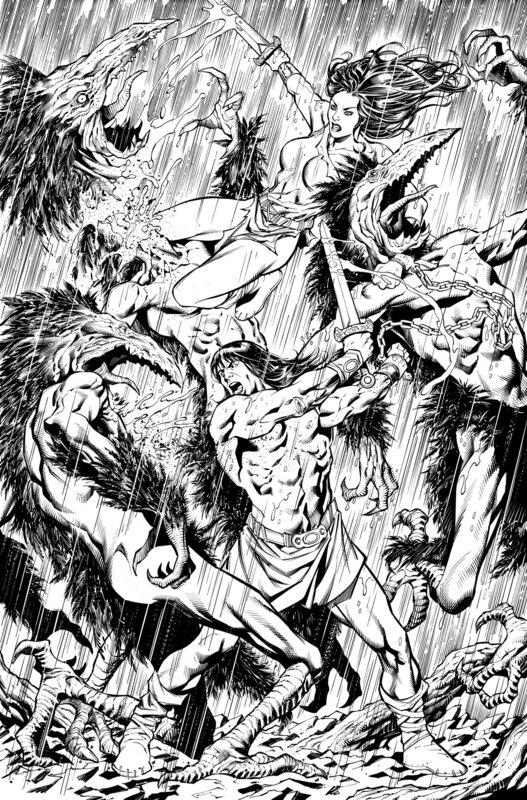 This is page 13 and one of my favorites from the issue (and not because Conan rocks Wonder Woman). 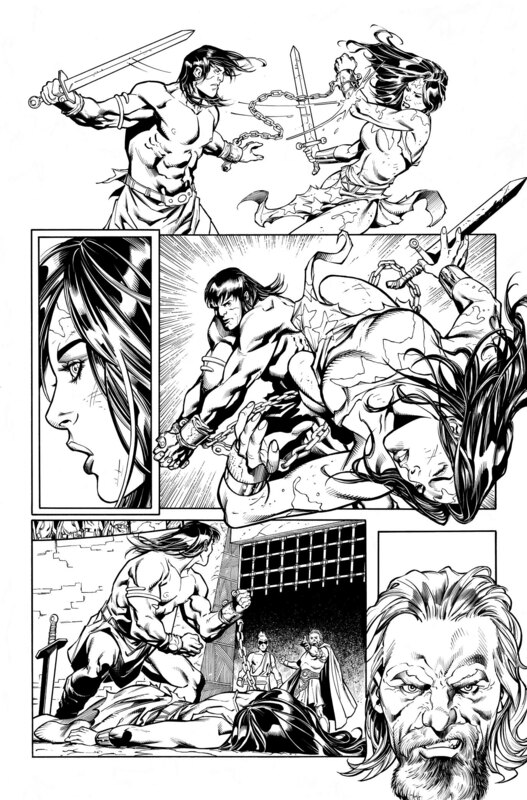 I love the way the figures and faces came out on this page. I feel pretty confident you can figure out why I like this page! Let’s take a look a some of my favorites from issue #3. These are pages 5 and 6 and one of my favorite sequences from the series. 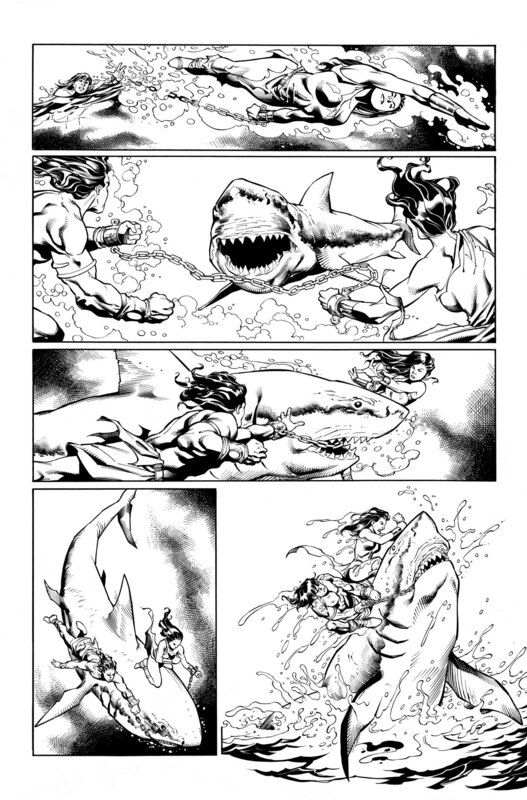 The story telling, the figures, the faces, the sharks and some tremendous brush work from Matt Ryan all work great together on these two pages. Pg. 12. 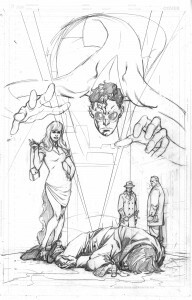 When this is the second best splash page in the issue you know you have some good stuff to draw. 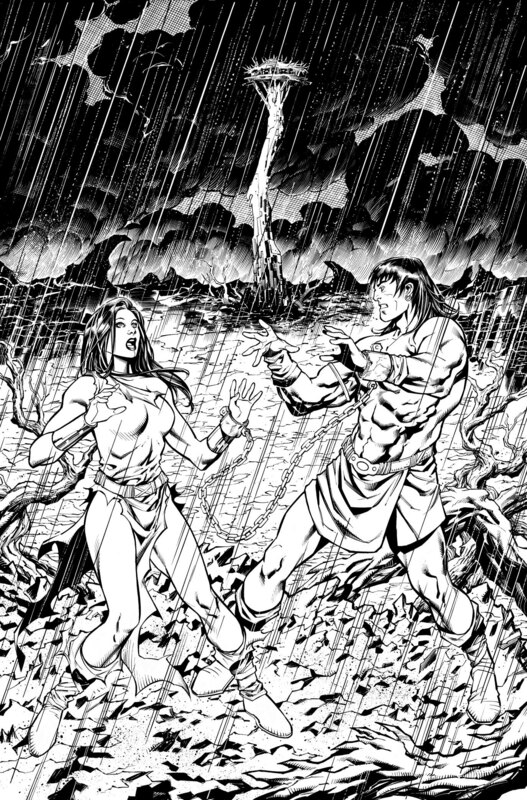 Matt’s handling of the background sky along with the rain is just terrific work. This is page 13 and features a really creepy transformation panel of the sometimes lovely and sometimes very disgusting Corvidae. Page 15 is another favorite page of mine. I really like the top panel. 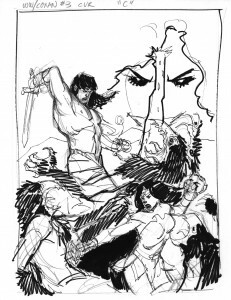 Conan’s posture as he sits on the horse works nicely for me as well. 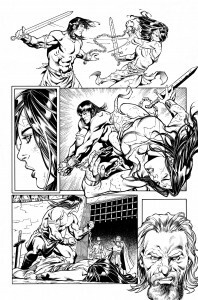 Page 17 has about everything you would want on a barbarian comic book page. It also has more nice rain effects by Matt. 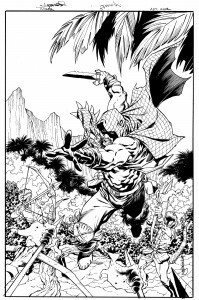 There’s nothing quite like the black and white art to get a real sense of the inking craftsmanship that is often lost in the printing process. That’s all I have for now. I will show more when issue #6 comes out in less than a month. Cheers! Future Quest Cover: The Herculoids! I have been waiting over a month to post about this cover. If you are my age or older you probably remember The Herucloids (if you don’t, YouTube it). 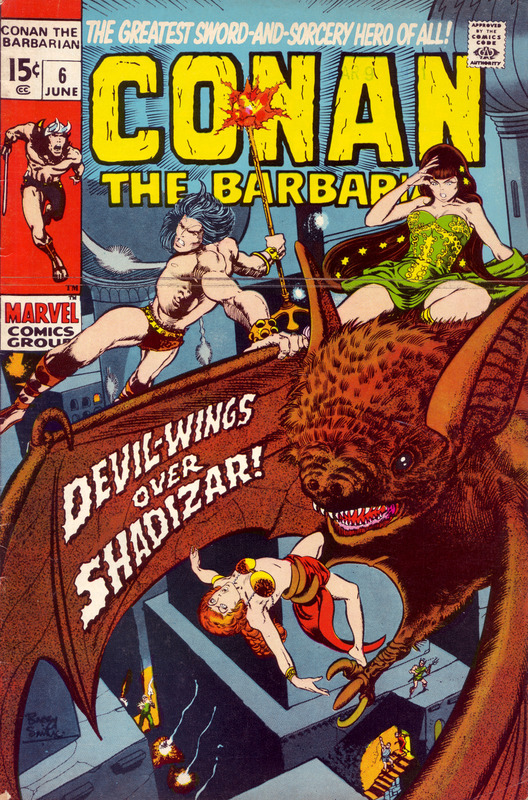 They were part of the Jonny Quest Universe that Hanna-Barbara introduced in the mid-sixties. I didn’t actually first see them until they were re-running them in the early 70’s on Saturday morning. Well, in case you are unaware, DC comics has re-introduced many of the characters from these cartoon shows into the DCU…..sort of. They started with a limited series called Future Quest (featuring Jonny Quest, Space Ghost, The Herucloids, Frankenstein Jr., Birdman, Mightor, etc.) and then followed that with the current Future Quest Presents series. 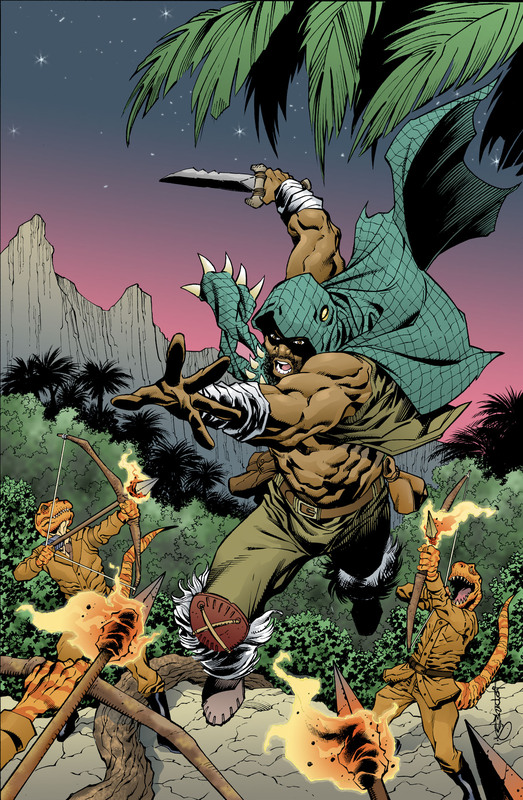 The former was one big story that contained all of the characters, the latter is a series featuring self-contained solo adventures. If you haven’t checked this out, you should. Enough of the sales pitch. 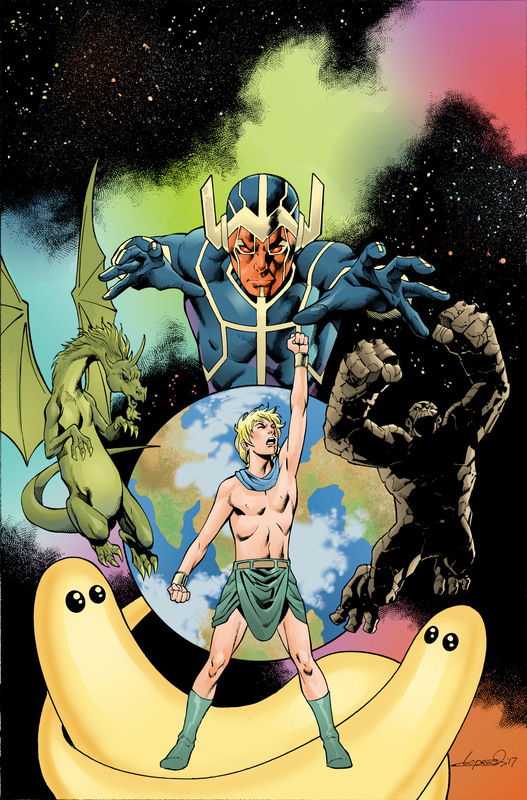 Here is the cover to Future Quest Presents #9. This book comes out in April and is the first of a 3-issue story arc featuring The Herculoids. 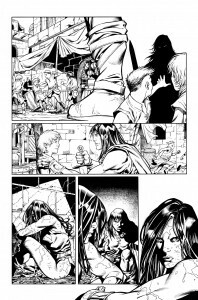 I am penciling the interiors with inks by Matt Ryan. The covers, for better or for worse are all me. I received an story outline breaking down the happenings in each of the three-issues. 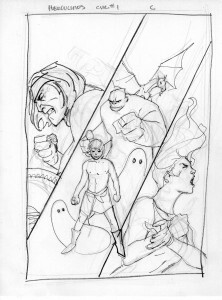 Using this as a guide, I came up with my cover concepts for the first issue. 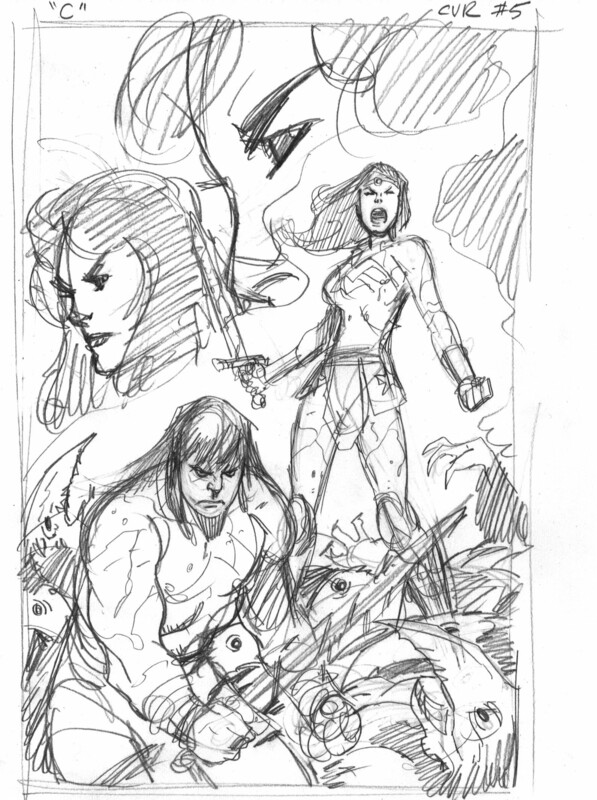 Here are the sketches I came up with. 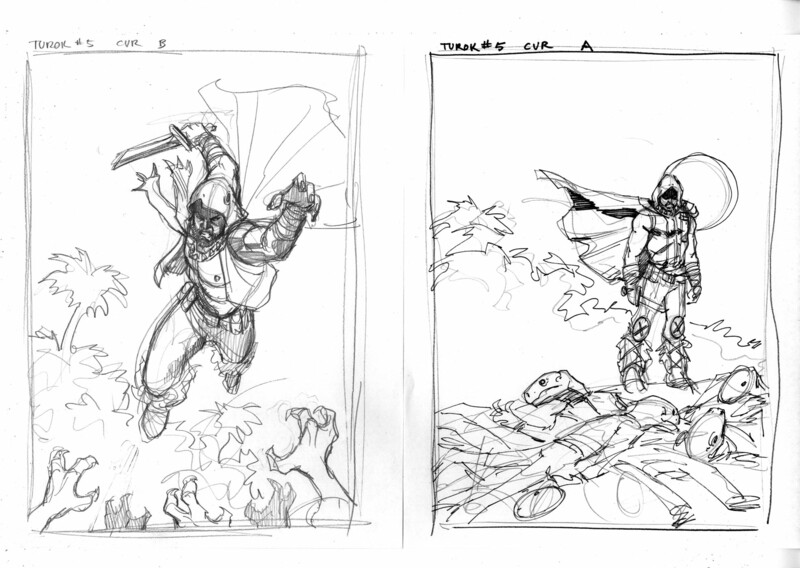 I produced 4 sketches for editorial to choose from. They liked “A”, so that’s what we went with. Now this story arc introduces a new villain so I had to do some character designs. 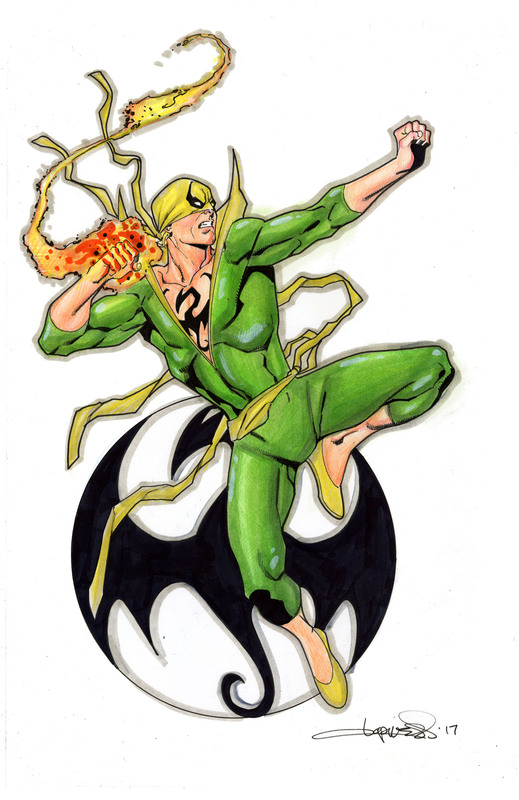 Since everything about this series is retro, I wanted the villain to have a retro feel as well. 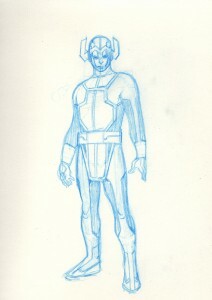 I decided to pull out some Kirby influence and I came up with this design. It seemed to fit with the vibe of the comic, so it was an easy approval. 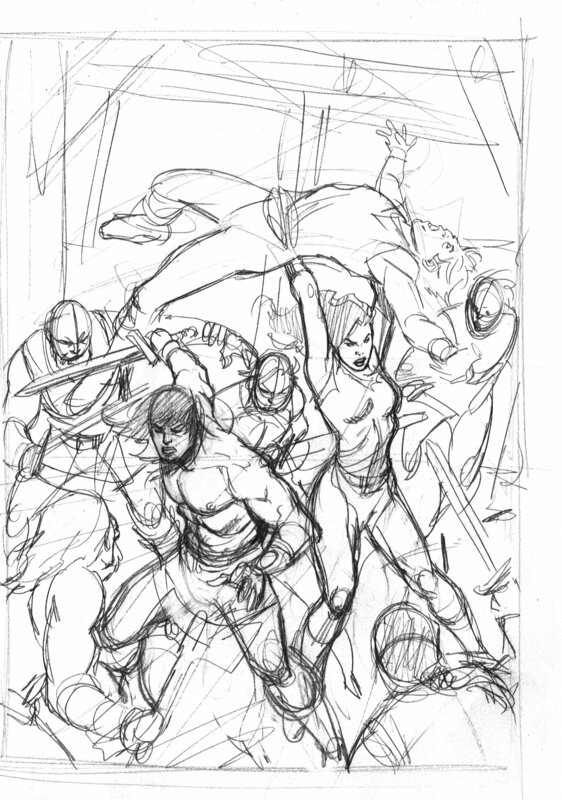 With a definite look in my mind for the character, I started the cover. 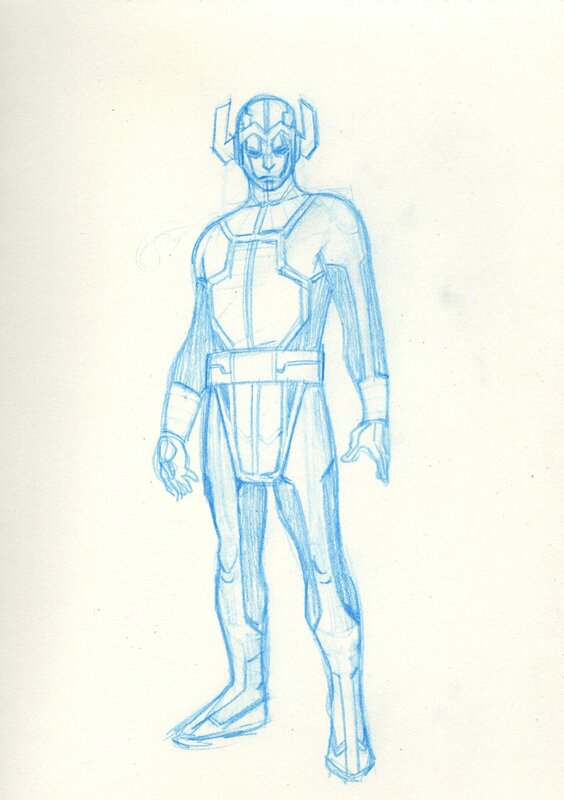 I wanted the villain to have a more interesting and dynamic pose than I produced with the sketch and came up with this alteration in the pencil stage. I went with more delicate cross-hatching than normal for me in order to get a different look. I left the background blank because I knew it was going to be black with a star field on it. 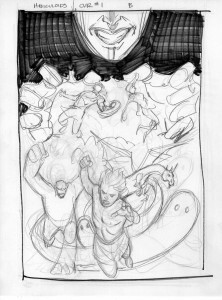 No need to color all that area in with a pencil when you are going to do it in black ink anyway. Staying true to my throwback training, I used a toothbrush dipped in Pro-White to splatter the star field onto the black background. 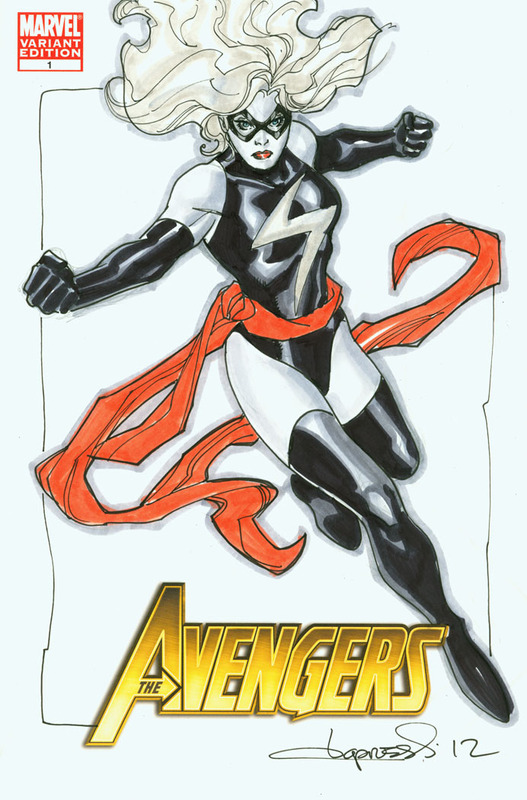 Unlike a lot of my covers, I had a pretty good idea of what I wanted to do with that nebula streak in the background. Vibrant color! However, I had no idea how I was going to handle the planet or the villain’s color scheme. I was pretty sure I wanted to go with an orange or red face but wasn’t sure what that would mean for his costume color. I tried to use a lot of the same colors in the background nebula that we would be seeing in the foreground characters to create a little harmony despite the wide array of colors. I think it works pretty well. After trying a variety of face and costume color combinations, I ultimately stayed with the orange-ish face for the villain. Blue being the complimentary color to orange, made perfect sense as the costume color. The trim color was hit and miss but I finally decided on the pale yellow as it worked well with the overall color scheme was not offensively bright or garish. The other problem I had to solve was coloring the planet. I found some shots of earth from space on line and tried to mimic the coloring of the continents that I saw. A warm tan for desert and green for jungle or forested areas. I used a brush with a splatter texture to blend the colored areas on the continents. I did a color hold or fill on the holding lines on the continents and then added clouds using that same brush. 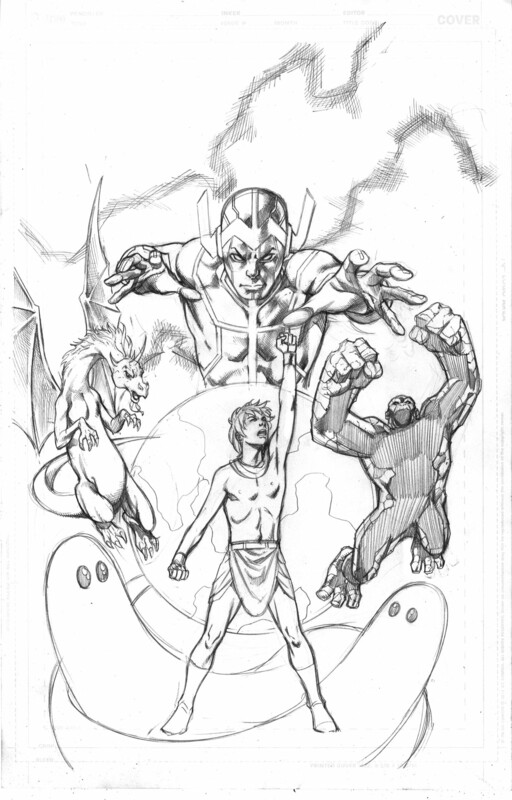 When I was done, the planet was too bright and was drawing the eye to it and past Dorno (the kid) in the forefront. Although the planet looked really bright and had great volume to it, Dorno and the Herculoids should be the focus, not a background planet. So I dropped a 15-20% grayish blue over the planet to knock it back a bit. It worked and now the focus of the piece is where it should be. Here are the two cover versions side by side so you can see the difference knocking the back the planet makes. It is really the brightness of the clouds that causes the issue. I really do like the whiter clouds better and if I did a cover where the focus was the planet itself, I would go with the brighter version. But as previously stated, I felt it was too distracting and needed to be knocked back. And that folks, is that. Thanks for continuing to tune in. 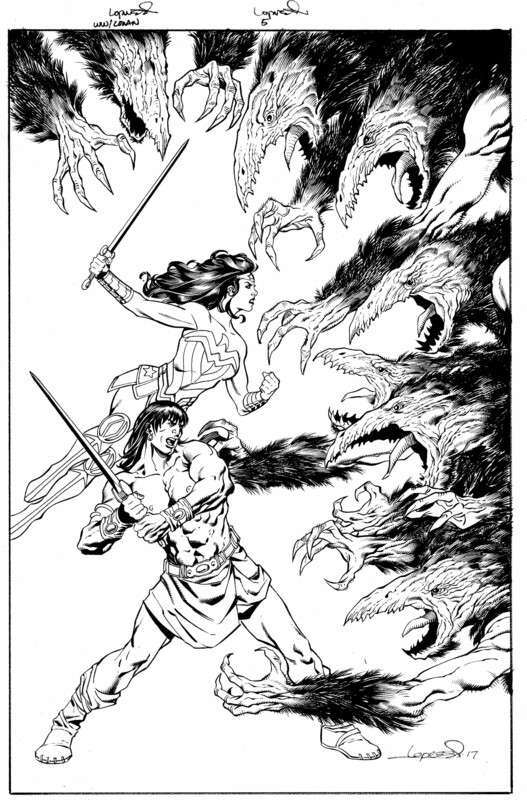 Next up will be the cover to Wonder Woman/Conan #6. I cover with another set of unique problems that I got to solve. See you soon! Like I always say, “A new year deserves a new post” (actually this is the first time I’ve ever said that but now I will make it a tradition). 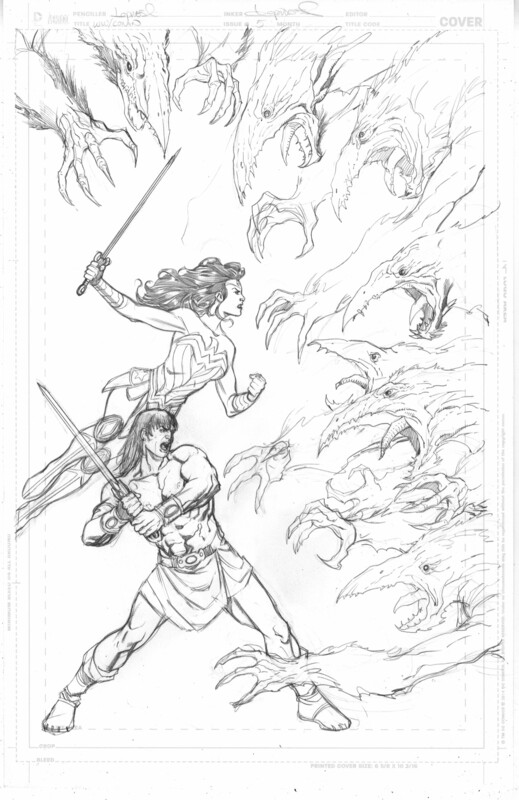 Today (or this evening as it were), let’s take a closer look at how I put together the cover for Wonder Woman/Conan #5. 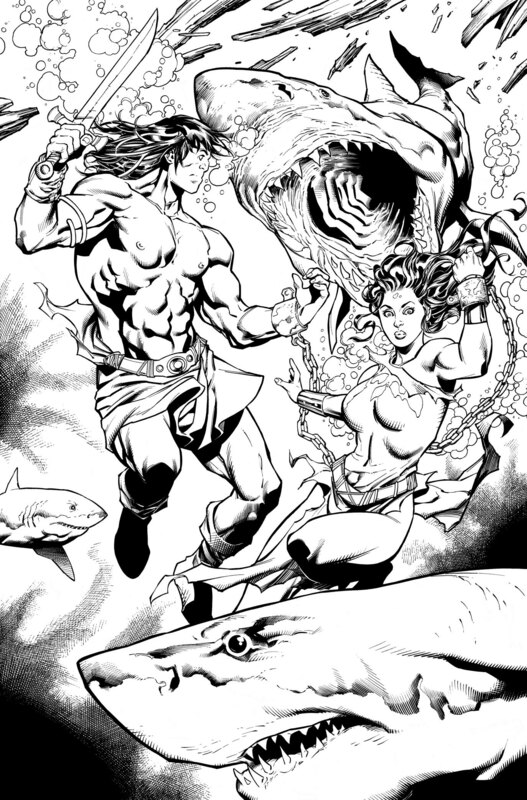 Due to a deadline problem, I actually got to do the regular cover for this issue as opposed to the alternate cover which I have normally been doing. I’m not sure that really makes any difference in the big scheme of things but it could be the answer to a trivia question some day. 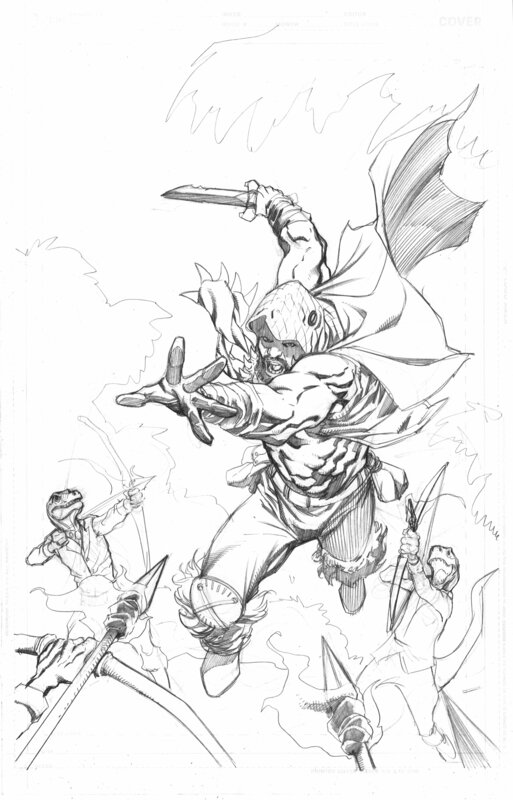 I got a late start of this cover because I was informed just a few days before it was due that I would need to step in and do the regular cover for this issue. 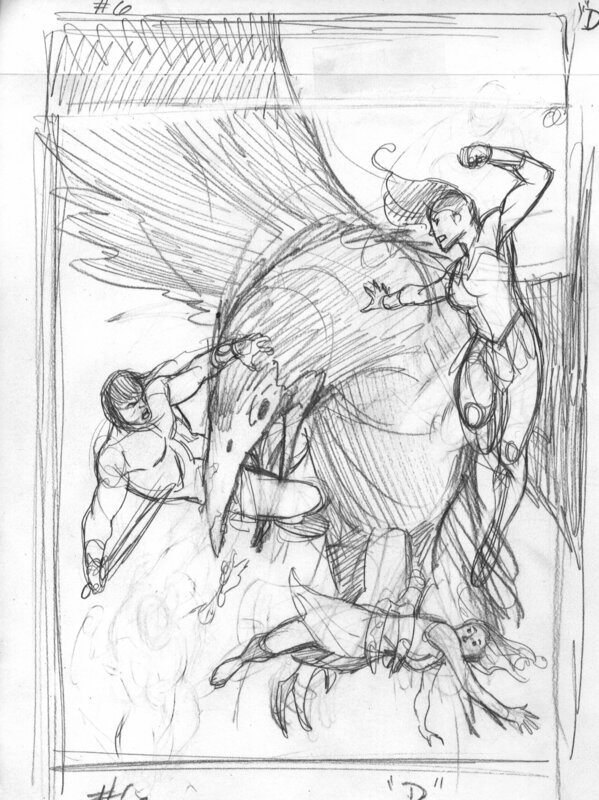 I still managed to do a few cover sketches, however. I could have easily gone with any of the three but “A” was chosen. 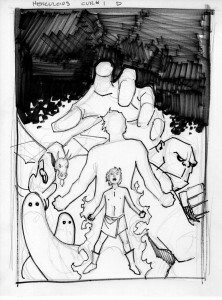 It’s interesting in that I had just finished the cover art to #3 when I had to jump on to this. I didn’t really know what was happening in the issue other than a brief description. 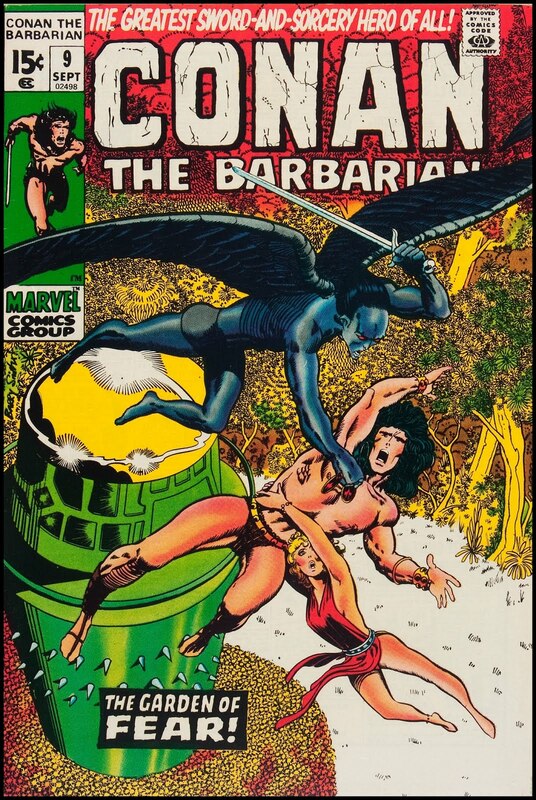 As it turns out, this cover ended up being a not very accurate depiction of the contents of the issue. 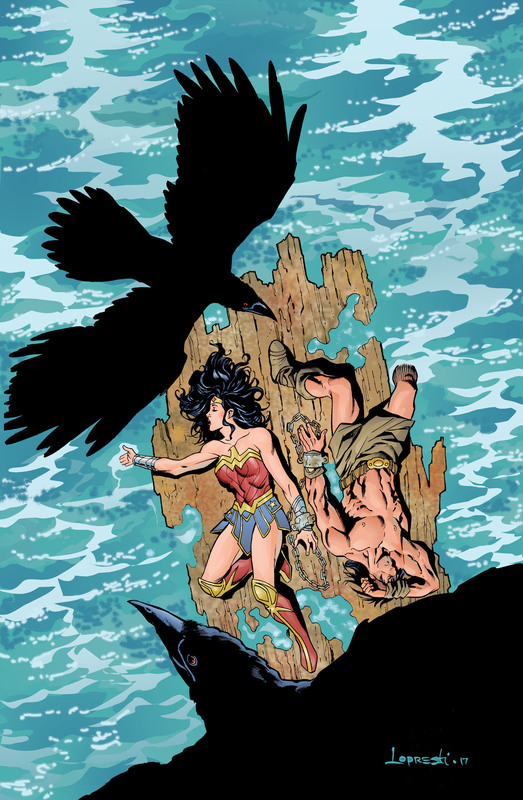 Interestingly enough, my alternate covers are much more accurate to the content of their given issues because they are not due 3 months prior to their release date like the regular covers (because of the solicitations catalogue). 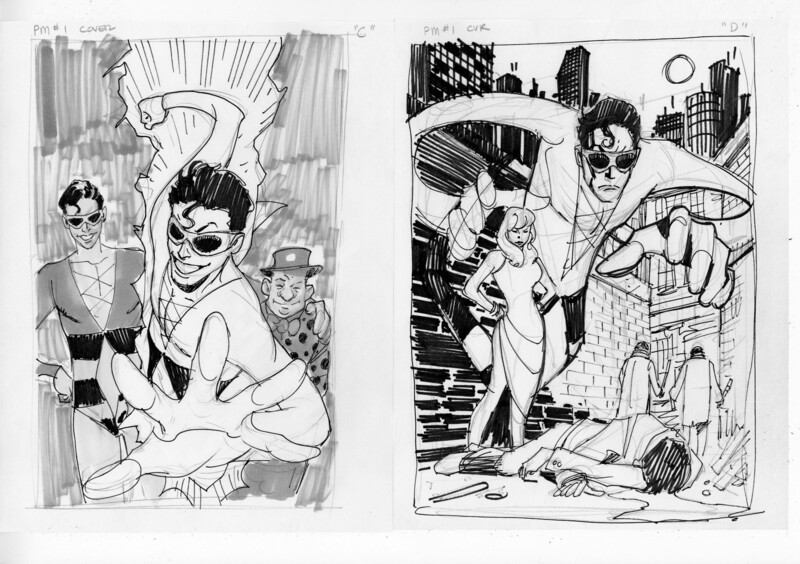 So I always have had the script in hand before drawing the alternate covers. 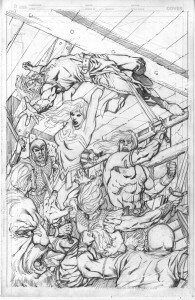 Here is the finished pencil art for the cover. I knew the bird creatures would be covered in feathers, so I didn’t waste my time drawing them in. I just put them in during the inking process. I felt (after the fact) that Conan’s nose was little to thick (or big) so I went in with a little white out to the right of the bridge to thin it. I also moved his right eye over just slightly in photoshop. It’s always interesting the things you “suddenly” see after you have scanned a piece and are looking at it close up on screen. As usual, I had no clue what I was going to do with the background. It seems faster or easier sometimes to leave out the background but then that becomes a problem that has to be solved in the coloring stage. I create masks in photoshop channels for almost every shape. That way if I want to change the color of Conan’s skin, I just go to the mask channel with the “magic wand”, activate the shape, go back into the CMYK channels and change the color. It is much easier than going in and re-lassoing a shape you want to color change. For the background, I have discovered it is much easier to lay a color over the entire piece of artwork and then go in and lasso the foreground characters or elements (separately, of course) to establish their individual colors. Once all of the foreground (and mid-ground) elements have been colored, what is left is basically a background color mask. This background template has been created by process of elimination. Now, the background color can be easily changed and/or adjusted by “magic wanding” that remaining “template”. 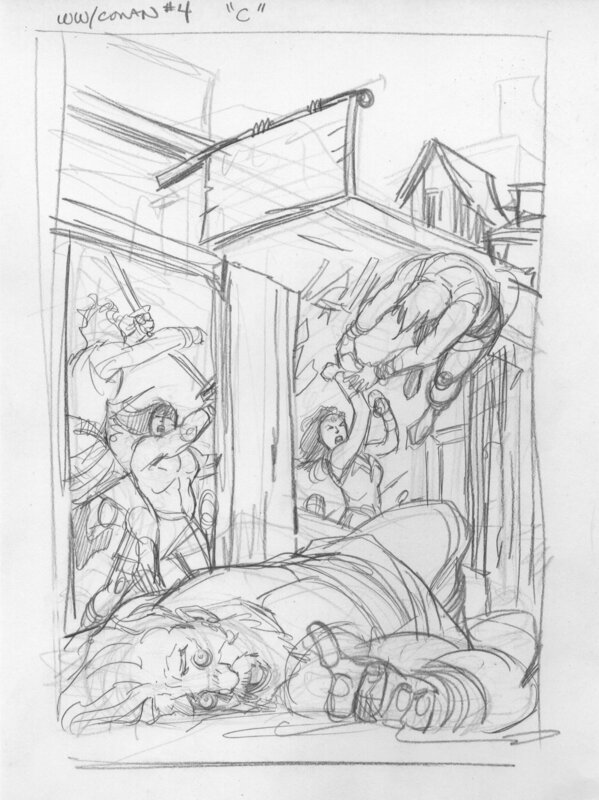 If I skip this step, I have to go in a “re-lasso” areas I have already lassoed (parts of the foreground elements) to create a background mask. Which is not very efficient. Back to this cover- I wanted to make the background seem like maybe a portal had opened up or a dimensional rift to allow the bird creatures in. So I used a circular fade going from a very pale yellow to an aqua blue. 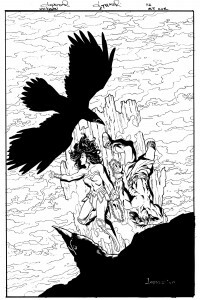 I then used one of the brushes (at a very large size) to created the wavy cloud effect coming in with the bird creatures. I used the same color from the bird creature’s feathers in the cloud effects to establish some color harmony between the two. 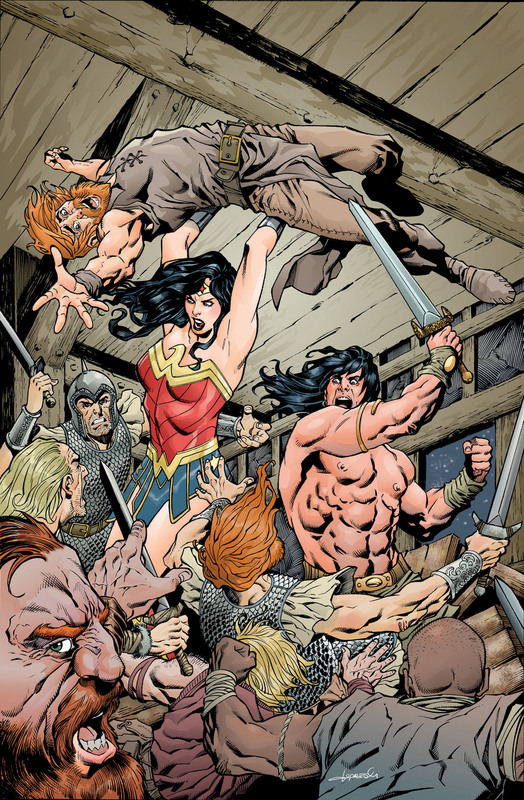 The pale yellow from the circular fade also shows up in the creatures’ flesh tones as well as the highlights on Wonder Woman and Conan’s skin. For a cover that had to be turned around relatively quickly, I am pretty please with the results. As always, thanks for checking out my blog. See you soon. I hate having to wait until a company officially releases a cover on line before I can blog about it. In some cases I am waiting months! You can’t have a blog if you don’t have content. 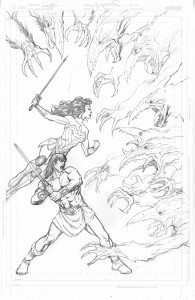 Well, I do have content for the cover to Wonder Woman/Conan #4, so let’s take a look at it. By now you should all be aware of the format. 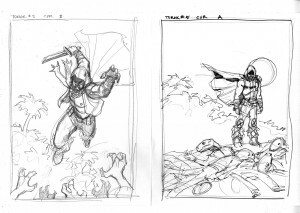 Let’s first take a look at the cover sketches I did for my editor(s). 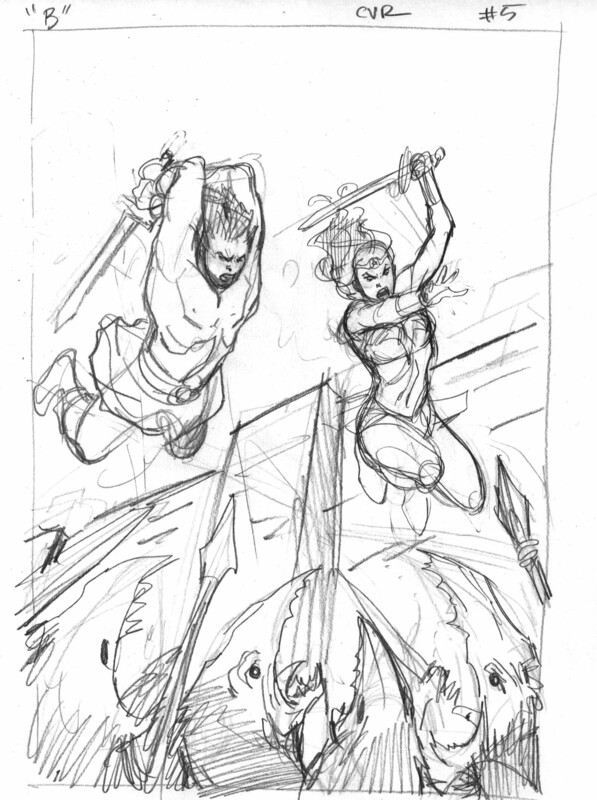 I have been pretty generous with the quantity of cover sketches I have done for this series. It is so much fun for me, I usually end up with several ideas. I might have gone a little too far with this one. 5 is a lot. However, some of these are very similar with just minor adjustments. Clearly there is a bar room brawl in this issue and it is the main thing I wanted to focus on. 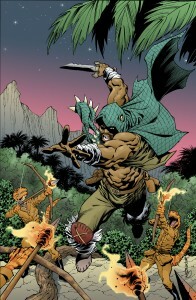 It allowed me to do an action cover without really giving away too much of the important content of the issue. 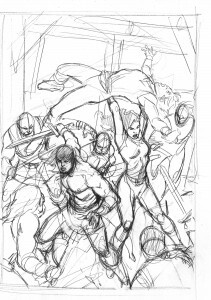 The editor’s chose “A” but with the caveat of removing the chained fists from the top and bottom of the composition. 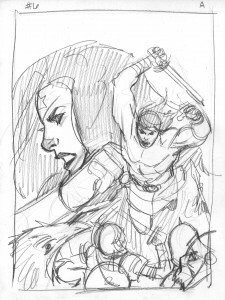 Once that was decided, I did two new sketches (the last two shown above) each featuring Conan and Wonder Woman fighting in the tavern. The fourth one shown above was the final choice. Personally, I like “B” and “C” best but what do I know? 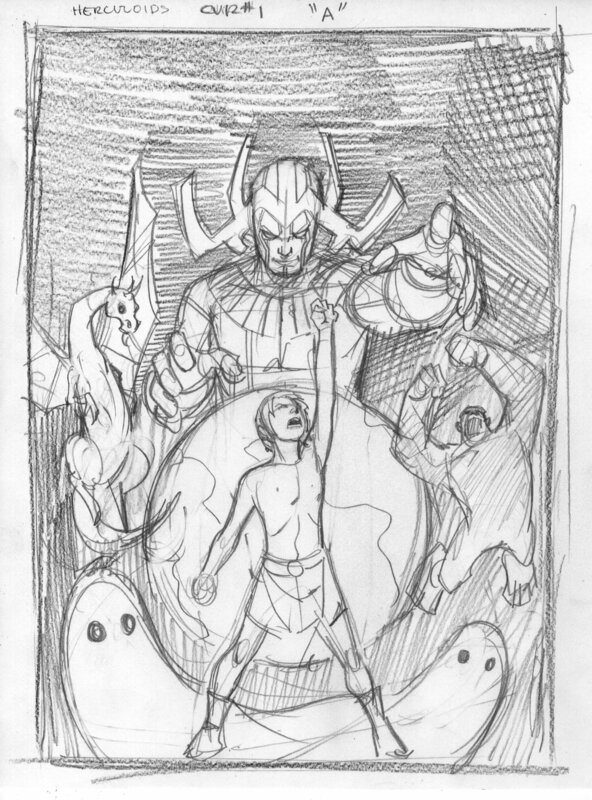 So like any good artist, I did a pencil drawing of the cover and it looked something like this. 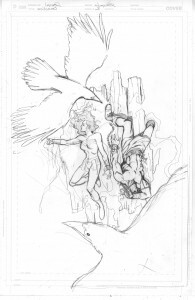 Because I am dealing with two editors at two different companies on this project I have found it is easier to show both every step of the process, so I am not making changes on an already inked or colored cover. 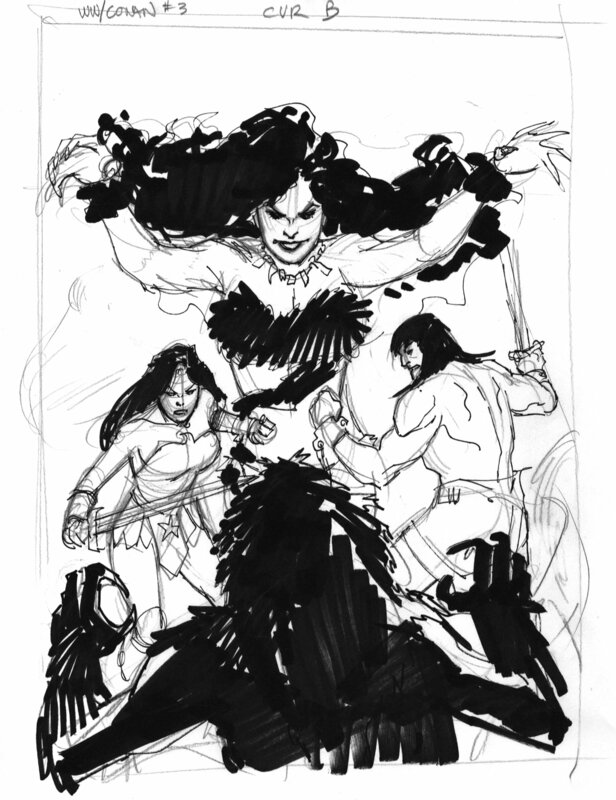 Once ok’d, I inked the cover using mostly a no.2 brush and my own special mixture of black india ink. 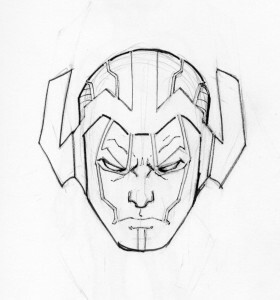 Like always, there is a little bit of pen work here and there, especially on the straight edges. Success! So I moved on to the coloring portion of our show. 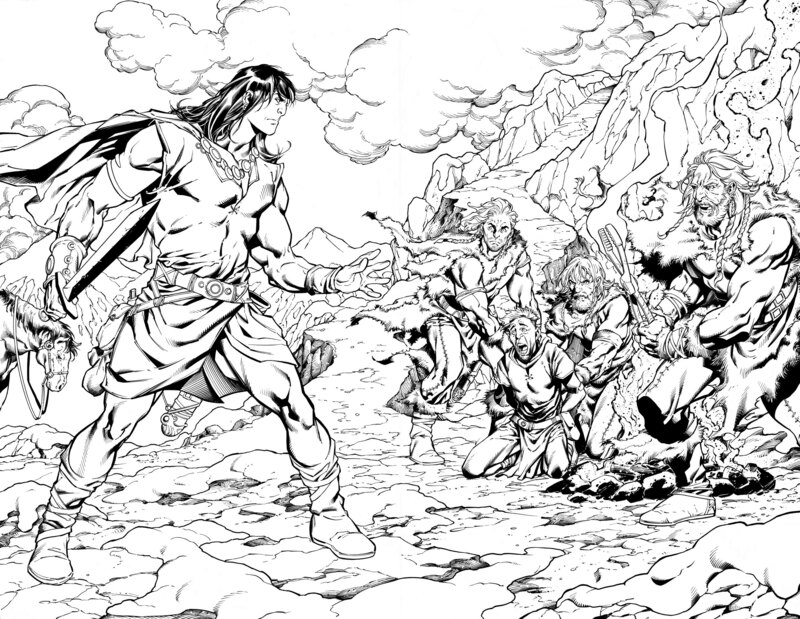 I scanned this at 1200 dpi bitmap, changed to grayscale then to CMYK and then reduced to 8X13 600dpi. No particular reason for any of that except that I am paranoid about losing detail when I reduce the file, so I keep it as large as possible but still at a workable size. Here is the finished product but there are a few things I want to note. First the basics. If you look behind the heads of Wonder Woman and Conan, you will notice that the wood is significantly lighter there. I did a circular fade on the wood to help both characters separate from the background and to help draw the viewer’s attention to that spot. Then by doing a color fade inside a lasso tool shape, I created the wood grain. 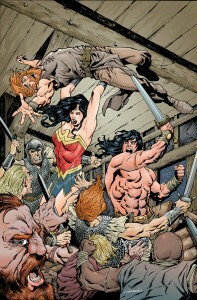 I colored all of the characters, making sure that Wonder Woman and Conan had distinctive flesh tones. 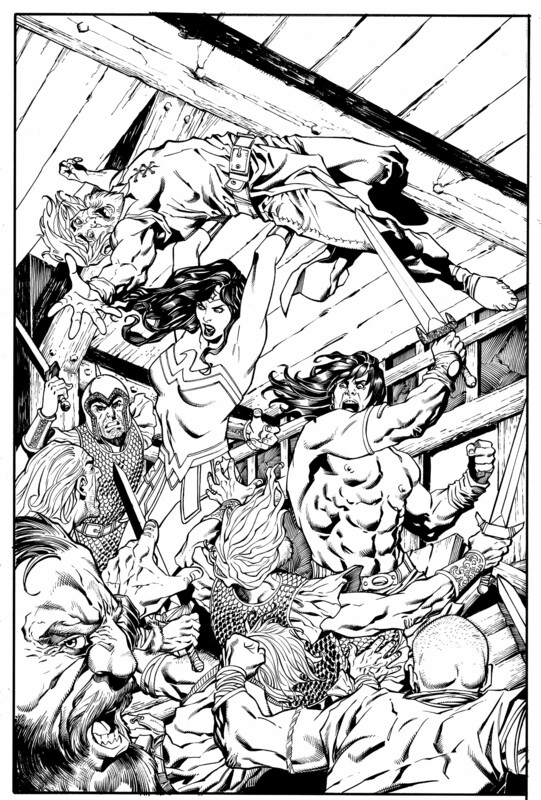 I really wanted to make sure that Wonder Woman and Conan were the brightest spots on the cover so I dropped a 15 or 20% (I can’t remember exactly) blue over the top of all of the characters except WW and Conan and the guy Wonder Woman is lifting. This makes them all cooler and darker (without being obvious) helping your eye go to our stars first. And that ladies (I hope their are a few) and gentlemen is how I did it. 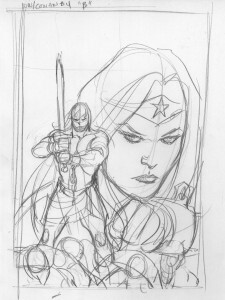 Thanks for stopping by and look forward to Wonder Woman/ Conan #5 cover coming soon. 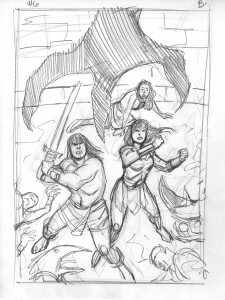 If you have been up at night tossing and turning wondering, “How did Aaron possibly come up with the cover to Wonder Woman/Conan #3?”, then you will be able to sleep well tonight. I am going to reveal to you, how the whole thing came together. 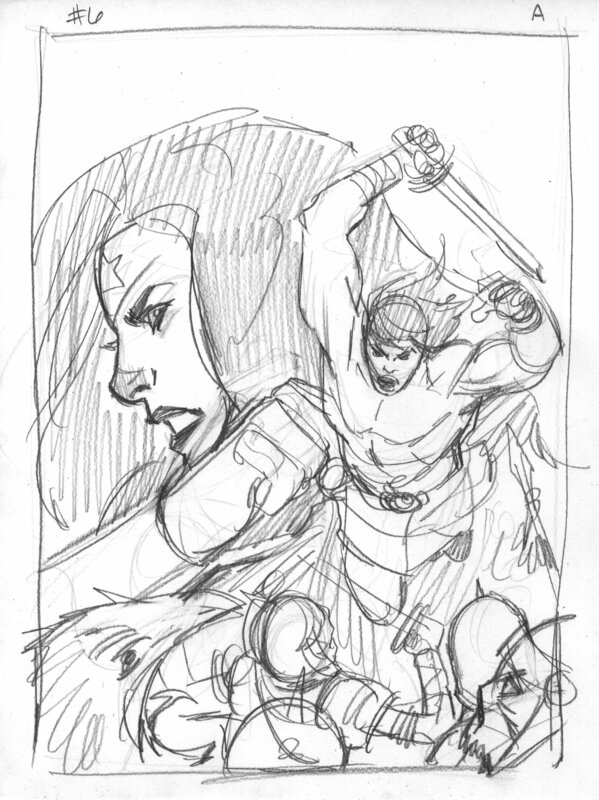 As previously established on this very blog site, I am only doing the alternative covers for the Wonder Woman/Conan limited series. 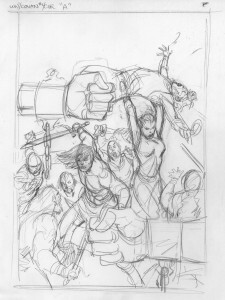 (With the exception of issue #5, where I am doing the regular cover. Another story for another time!) 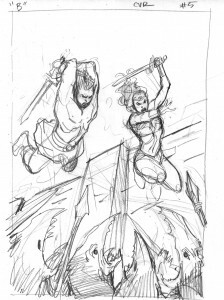 The thing about alternative covers is they don’t get released anywhere near as early as the regular covers do so I can’t do these blogs as quickly as I would like. 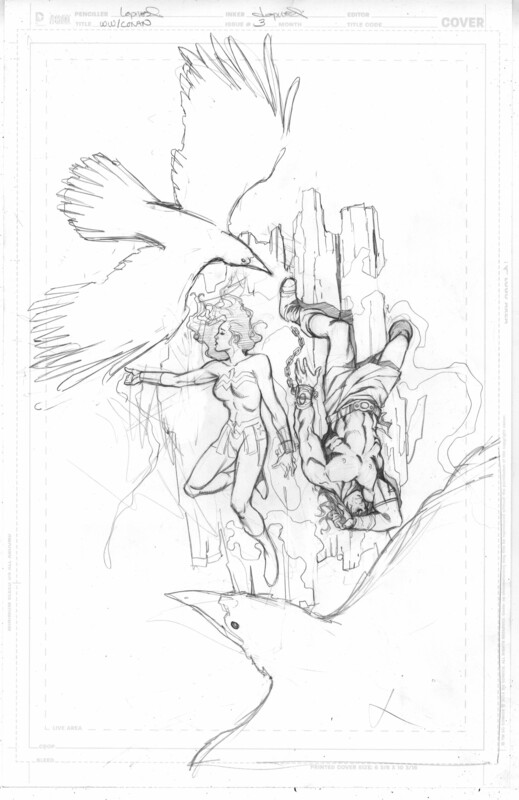 But the cover to #3 has finally leaked out, so let’s take a look at it now. 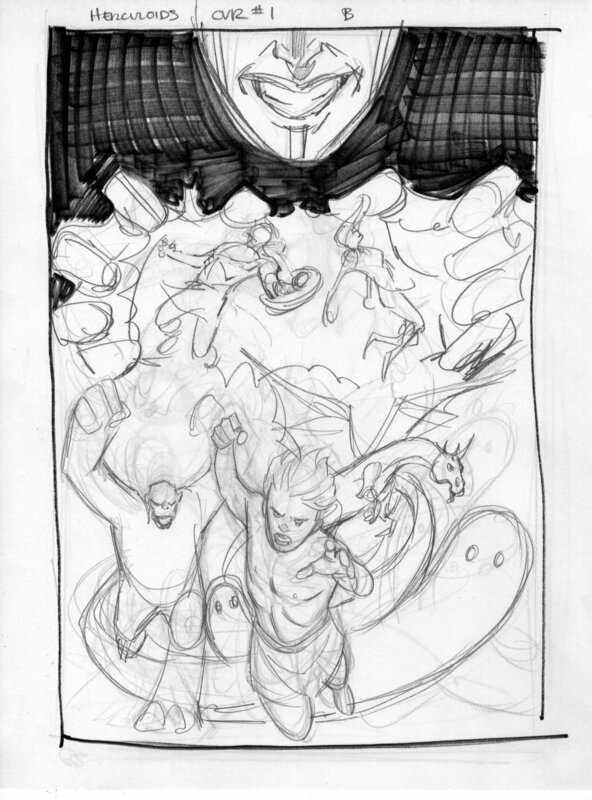 This series is very important to me, so I have really gone overboard with the cover concept sketches. 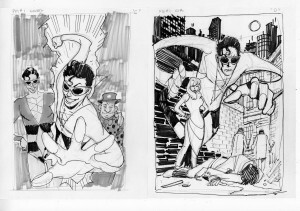 For this particular issue, I merely drew three but I did them all in ink. Just to give a better, hopefully more clear vision of what I was going for with each one. “A” got chosen. 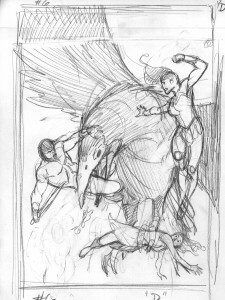 It’s not the most dynamic of the three but it is probably the most interesting composition and probably the least familiar of the ideas. I knew in advance the one potential road block to this cover was going to be the water. It is a big part of the cover and needed to be done right. 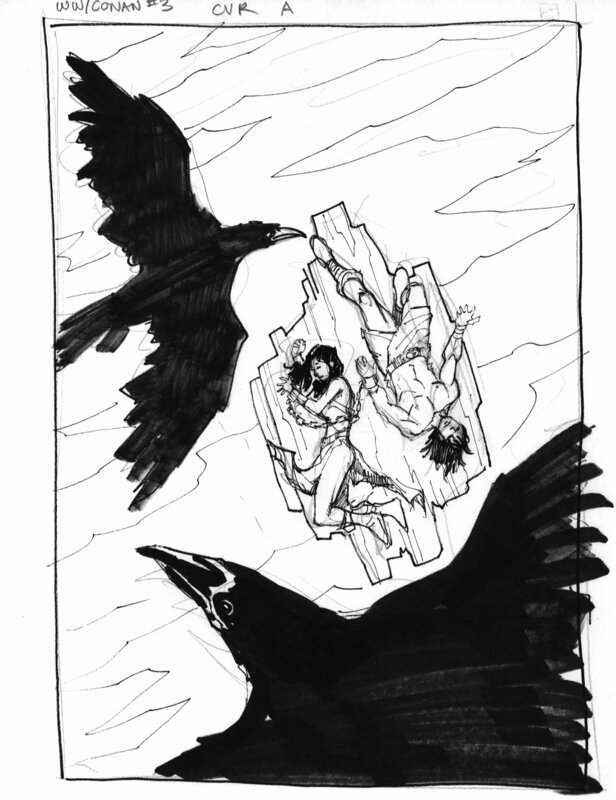 Dark Horse editorial wanted the crows to overlap with the raft so the depth would be more clear. I made that accommodation in the pencils. At this point I had no idea how I was going to handle the water. I knew I was going to do most of the work in the coloring but I just wasn’t sure how. I penciled in some light water ripples here but I wasn’t convinced I was going to use them. 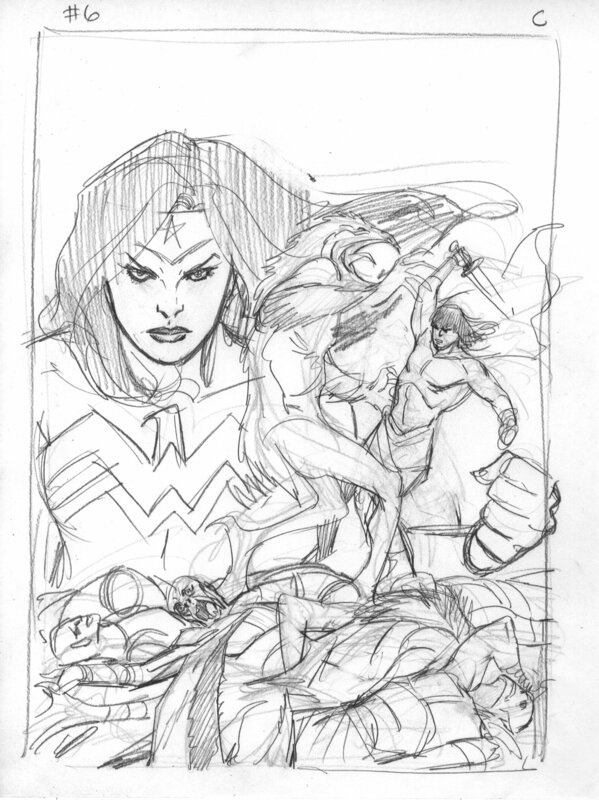 I did tighten up the pencils on Wonder Woman before I went to inks. After finishing the crows, the raft and our two main characters, I decided to go ahead and ink the water waves. I figured even if I didn’t use them in the final color version, they would help the black and white look more like a completed piece. Almost everything on this cover was inked with a #2 Kolinsky Raphael brush. I did do the water lines in pen. 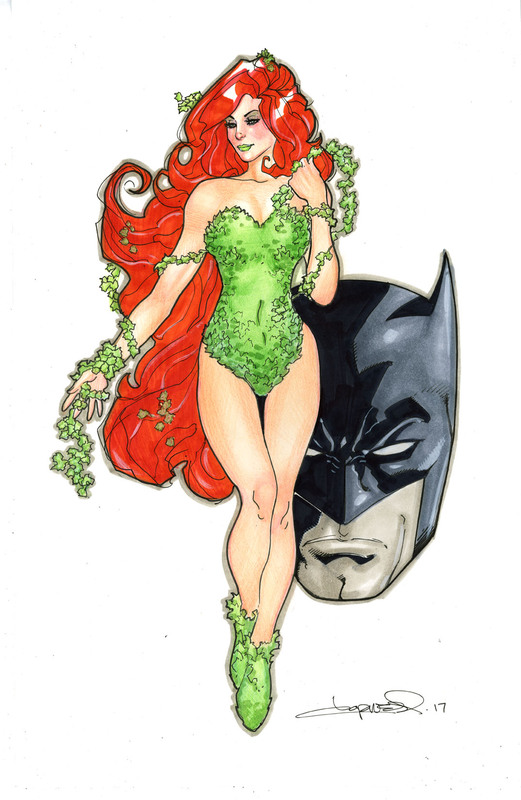 I scanned this at 1200 dpi bitmap. 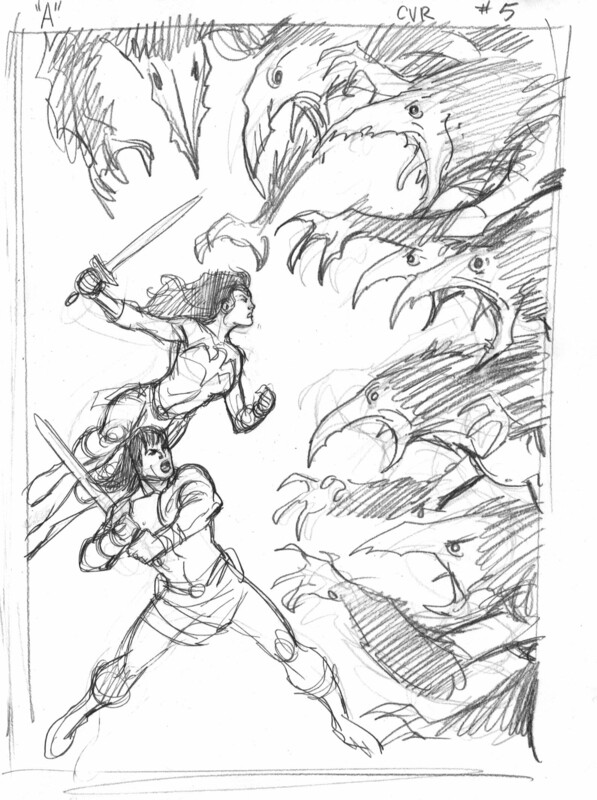 I do this because it requires less clean up than scanning in gray or color. Quite frankly, there is very little difference (if any) in scanning gray or line in terms of line quality. But the amount of clean up with a gray scan is way too much for someone as impatient as I am. 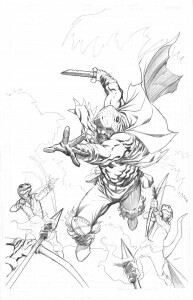 Once I got the line art dropped into a photoshop file, I knew I couldn’t stall any longer. I had to come up with a solution to the water. 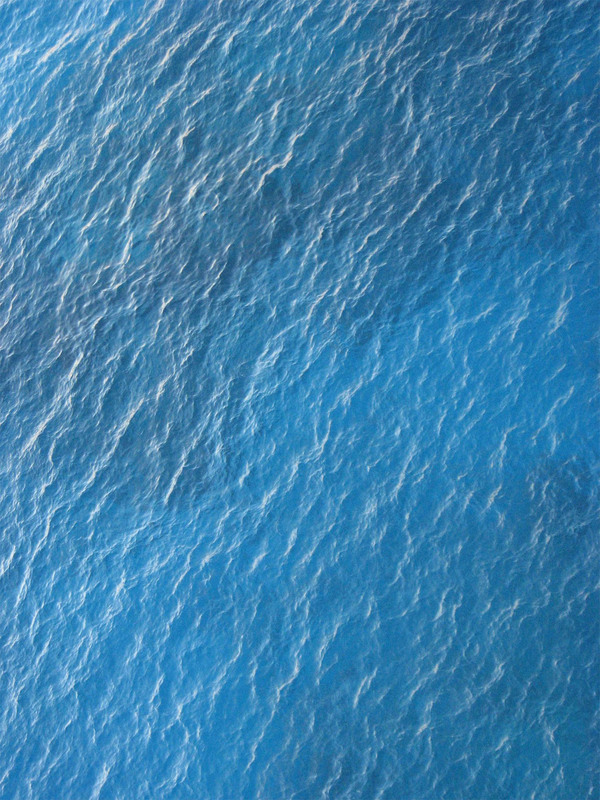 My first thought was to find an aerial shot of the ocean that matched the angle my cover was drawn at. I thought I would drop the water photo in and I would be done. 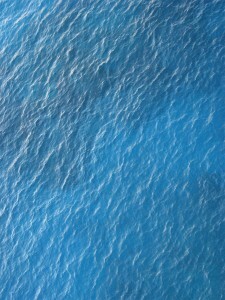 Here is the water photo I lifted off the internet. I don’t have a file that I saved with art on this water but I can tell you that the realistic water against the illustrated figures didn’t look right. At this point I knew I had to create the water in photoshop. 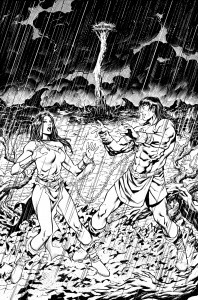 At first I colorized the water line work but I didn’t like that either, so I dropped the black and white line work from the art and began the process of creating the water completely from scratch in photoshop. I used a combination of fade filled lasso’s and free hand brushes. Eventually, I came up with this rather stylized ocean representation that I think works well with the figures and raft. Even as I was creating the water, I had no idea what I was doing. I just kept adding layers and fades of color until it became what I wanted it to. A lot of trial and error. Of course, that’s the great thing about digital coloring, if you don’t like your work you can just delete it and try something else. All in all, I really like how it turned out. I like the rich colors in what is essentially another Blue/Orange complimentary color scheme. And that is how I went from white piece of paper to digital color file. Next time we’ll take a look at the cover to Wonder Woman/Conan #5. Until then…. Most people don’t get a chance to see the Black and White artwork associated with a comic unless they are art buyers. 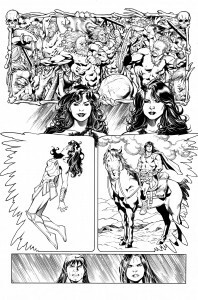 Although Wonder Woman/Conan was wonderfully colored by Wendy Broome, I think the pages from this first issue are really cool in black and white as well. 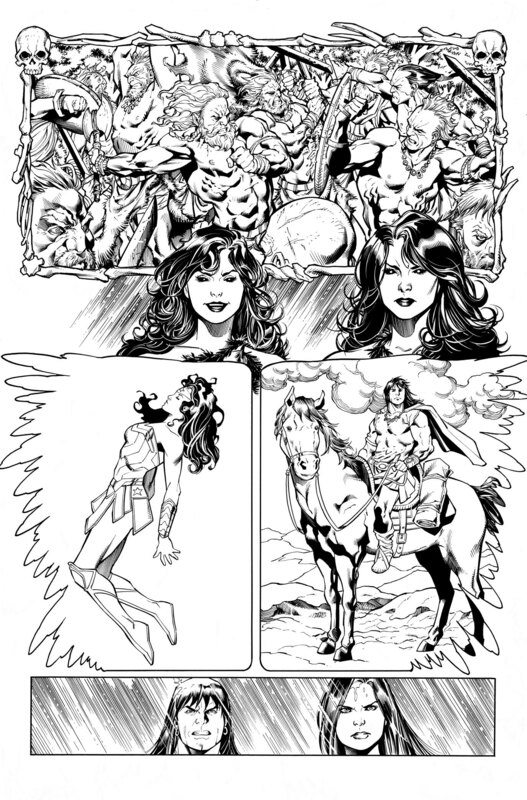 Here are the two double page spreads from the issue along with a couple of other pages. Spoiler alert if you haven’t bought and read the comic! And if you haven’t, shame on you! 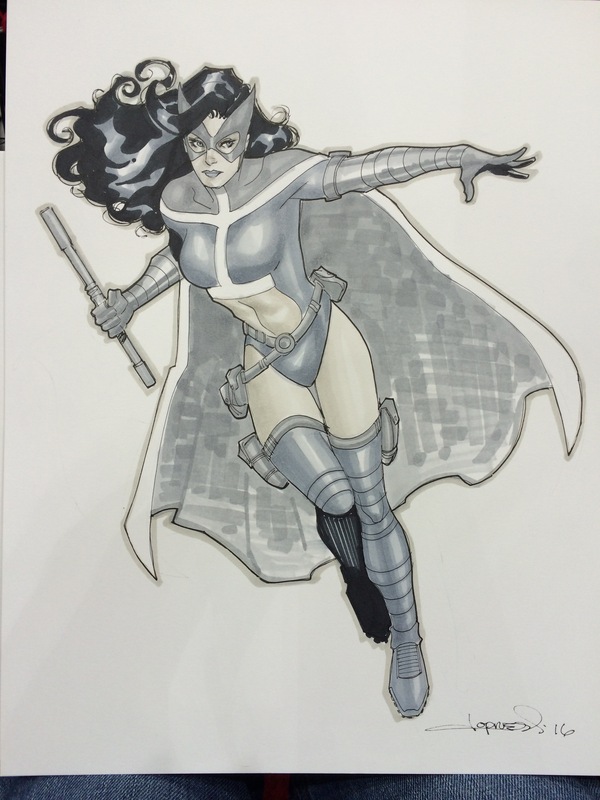 I’ve worked with a lot of good inkers over the years but Matt Ryan seems to get my sensibilities better than anyone. 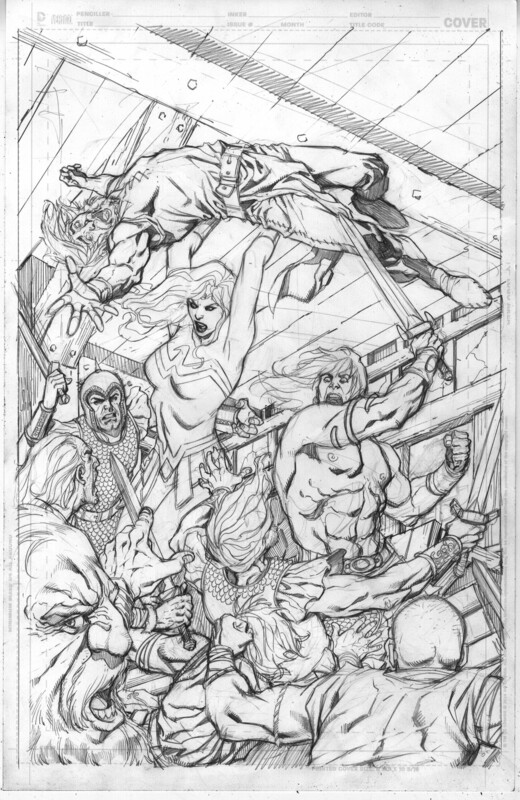 It’s always tough doing a splash page or double page splash when two characters or sides are facing off. You need to show both with some depth, even though they are facing one another. 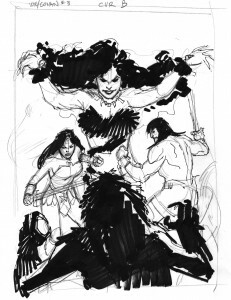 Here is my solution for Conan’s big entrance into the story. The story called for Wonder Woman’s face to not be clearly visible to the crowd so I had to draw her in a way that her hair covered her face. Same challenge here that there was for the previous spread, show Wonder Woman and her opponents even though they are facing each other. Problem solved but not after some trial and error. 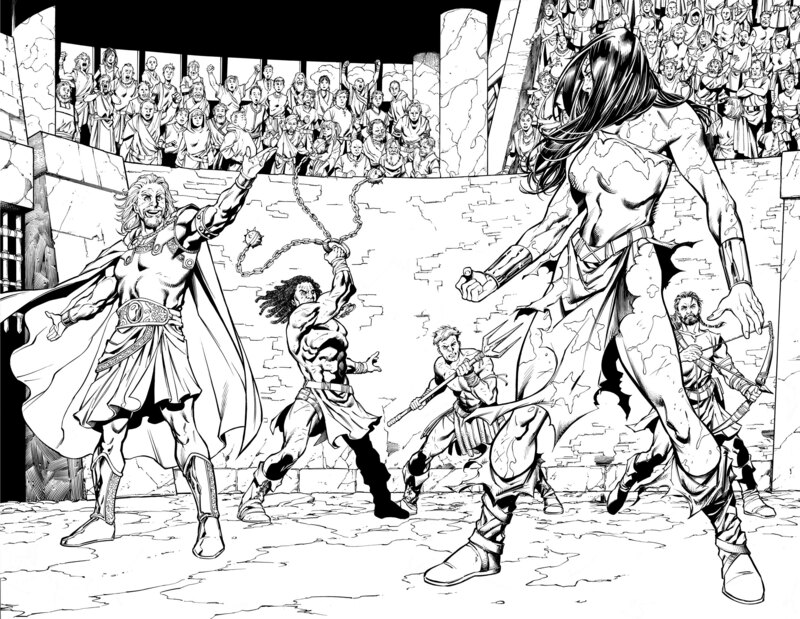 Again, terrific inks by Matt Ryan, especially on all of the tiny people in the crowd. 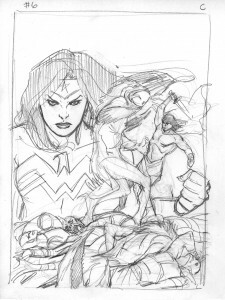 I really like the figure work on this page (panel 3) and the final brooding close up of Wonder Woman. I usually sell most of my pages but some of these are going to be hard to part with. 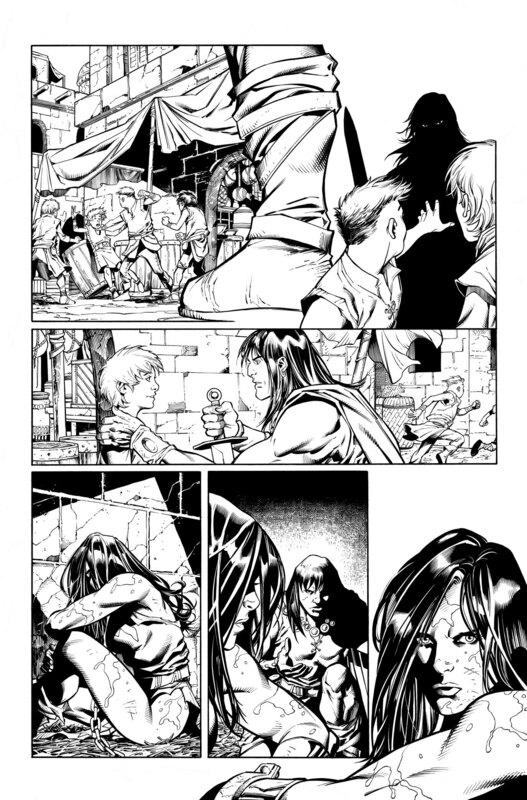 I like this page better after Matt’s inking then I did after I penciled it. I’ve sold this one already and I am already missing it! That’s it for now. I just wanted you to experience a little bit of the thrill I get when the Matt Ryan sends me back the inked originals and I get to see them full sized for the first time!